It was yet another season to remember for Michigan soccer fans. The 2018 Wolverines will go down in team history as one that provided an NCAA Tournament win in one of the most thrilling matches you could imagine. While the season ended earlier than the squad may have hoped, the results all throughout the season gave fans reason to smile. Michigan started the season with an opening match loss at home to Tulsa. This opening defeat did not phase them. The Wolverines followed up with a nine-match unbeaten run, included eight wins over the nine games. This stretch of form set the rest of the season in motion and gave them the confidence they needed to play up to the standard of a top three team in the Big Ten by the end of the season. When thinking of top matches of the season, a top three stands out pretty clearly for the Wolverines. Without question, the penalty shootout thriller in the NCAA Tournament with the Wolverines knocking off Princeton must make that list. Heroics from plenty of the players, notably Henry Mashburn for his clutch saves, and Noah Kleedtke for his game-tying goal during regulation, made that a night to remember for the Wolverines in cold and snowy conditions. Of course, the Wolverines may not even have been in the tournament without a final regular season victory over Maryland at UMSS. Maryland equalized late in the game and it seemed that the Terrapins were set to snag perhaps a point from Michigan. Instead, Jack Hallahan ended the match just 33 seconds into overtime with his golden goal. The victory clinched third in the Big Ten for Michigan and helped propel them into the NCAA Tournament with a season-defining victory. Rounding out a top three, one could not forget the eventful early-season affair at home against Western Michigan. In early-September, with a massive Michigan Ultras presence as the first game with students back on campus, Michigan took a 2-0 lead with just under half an hour remaining in the match, but the Broncos leveled over ten minutes with only eight minutes to play. 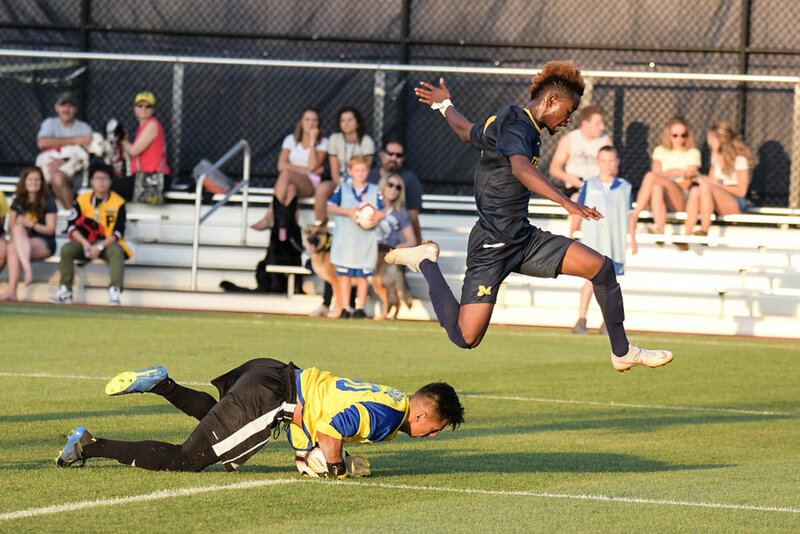 Michigan took advantage of a WMU red card and Ivo Cerda scored in the eighth minute of the first OT period providing the Wolverines’ fans with an exciting night of soccer. By any metric, Michigan’s players had an incredibly successful season. Michigan had a pair of 20-point scorers with Jack Hallahan (24) and Umar Farouk Osman (22) and Hallahan himself won Big Ten Offensive Player of the Year and a spot on the All-Big Ten First Team. He had an unbelievable year full of individual bits of quality that made fans’ jaws drop. He led the team in assists with eight and finished second to Osman in goals, also with eight. Osman had to adapt to a central midfield role with the injury to Ivo Cerda, but he continued to learn and produce. His nine goals and generally strong performances were good enough to put him on the All-Big Ten Second Team. Jack Hallahan (#11) was deserving of the Big Ten honors he received. Hallahan was a junior this season, and Osman a sophomore, but seniors set the tone for this Wolverines side. Two earned all-Big Ten honors while another was a surprise star of the season. Robbie Mertz was named All-Big Ten First Team and did not need to pad the stat sheet to make an impact. He led the Wolverines’ press with intensity and possessed outstanding leadership in midfield. Marcello Borges was All-Big Ten Second Team and constantly dissuaded opponents from attacking the side of the pitch he manned while getting forward with ease. Finally, Noah Kleedtke was called upon to lead the line with Mohammed Zakyi’s injuries over the season. In response, he tallied four goals, including massive ones to level games against Michigan State and Princeton. He is an outstanding success story and a player fans will look fondly upon. Of course, you cannot talk about this side without mentioning the iron men of the side. Henry Mashburn played every minute of this season in net while in the outfield, Jackson Ragen played all but three minutes for the Wolverines. The two sophomores were key to the success Michigan had. Mashburn’s penalty heroics capped off a solid season in net. With two more years in maize and blue, his development will be a treat to watch. Ragen’s leadership in the back earned him plenty of trust from head coach Chaka Daley. He is sure to be an ever-present force in the back line for the next two years. Robbie Mertz (#14) had a decorated career at the University of Michigan over four years. Speaking of that, let’s talk about the future. Michigan loses senior leadership in midfield with the graduation of Mertz and Cerda and also in defense with Daniel Mukuna, the supremely solid center back. They also lose a bit of depth in Kleedtke and Peter Brown. Presuming no unexpected underclassmen going pro, the attack seems to be automatically decided with Zakyi, Hallahan, and Osman, but what do fans have to look forward to? The NCAA Tournament gave fans a glimpse of what to possibly expect. Borges’ late-game injury to Princeton is gutting for him and the team, but in a tough spot it was freshman Declan Gaffney who put in a stellar 110 minutes. On the other side of full back, it was Joel Harrison also making his first start on defense, also putting in a superb 110 minutes. Harrison had plenty of hype surrounding him upon entrance at Michigan and while injuries slowed him, he figures to be fully fit for his junior season. Combined with Abdou Samake and Ragen, the back four for next season would figure to be straight forward. We already know that Marc Ybarra is going to remain his ever stable self in midfield. As a sophomore, he only continued to shine and seemed to rarely put a foot wrong in his run of play. Questions of who will replace Mertz and Cerda are less straightforward. One probability would be Austin Swiech returning to his more favored midfield role after a successful year-long stint at right back. You see on professional levels a young-midfielder playing full back to get game time. Perhaps that was this season for the sophomore out of Grand Rapids. 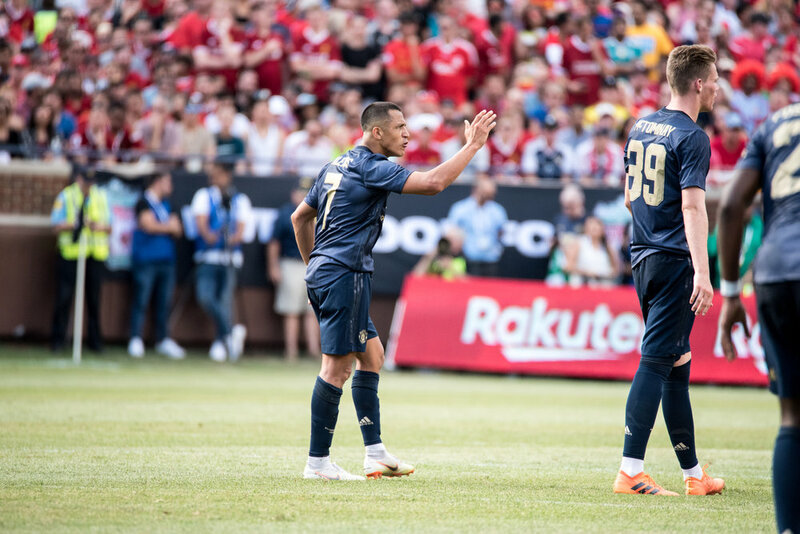 That other open midfield spot could see Carlos Tellez or Kevin Buca get some run after more play time has gone under their belt in the latter stages of this season. It has well and truly been a successful season for Michigan. We must thank the seniors for their dedication and commitment to the program, and wish them well in their future careers, whether that includes soccer, or whatever they may pursue. It is always tough to say goodbye to a season, but the hope is always there for next season. The key is now to continue building off a stellar two-year stretch into next year as mental preparations for next year have surely already begun. For the second straight season, Michigan was a participant in the NCAA Tournament. Tonight’s result was better than last year’s as Michigan won it in penalties by a PK score of a whopping 11-10. Michigan was pressed and pressed hard to start by the forwards of Princeton. Jeremy Colvin got a pair of nice chances, one being deflected wide, another simply going wide of the net. While the ball could not find the back of the net, it was a sign of dangerous things to come. Noah Kleedtke (#16) takes a shot around Tigers defenders Benjamin Issroff (#5). There was a shout for perhaps a red card when Henry Mashburn rushed out of his net and made a sliding challenge on a charging man in orange. While the Princeton fans in the crowd wanted a yellow, or perhaps more, Mashburn got off without being punished and Michigan fans took a sigh of relief. Princeton finally got a goal after dominating the flow of play in the 39th minute. After a free kick taken by Michigan, it was Princeton who got the counter attack. Moulay Kanzi Belghiti, a freshman midfielder, evaded Austin Swiech and skirted through the Michigan midfield, played a nice ball to the left wing that found Colvin, and Colvin played a short pass to Benjamin Martin who found the net. Marc Ybarra challenged the keeper off a free kick, but Michigan’s lone shot on goal could not find the net and the half ended with Princeton up 1-0. The second half saw more of the same physicality, but no serious chances. There was drama in the 65th minute when Mashburn’s leg was knocked into by a Princeton presser. Mashburn got down onto a knee several times in the minutes following, but, showing true heart, he stayed in the game. Michigan finally found a spurt in the 75th minute, and the game was leveled. Peter Brown sent a low cross into the box and Princeton failed to clear. It was Noah Kleedtke who ended up with the second ball. He held onto it, turned in the box, and fired to the keeper’s right in the lower corner. Kleedtke has, without question been one of Michigan’s best stories of the season. He continues to play brilliantly from the central striker role, and he tied the game up well with just 15 minutes remaining in regulation. There was a scrappy fight breaking out with four seconds to play and it saw Marcello Borges go down with a serious shoulder injury. Mashburn made a crucial save in the final moments to send the game into overtime. Overtime period number one saw limited action and yet another scrum to close out the extra period. Overtime period two saw nothing again, and we went into penalties. In a game that saw fourteen rounds of penalty kicks, tons of pressure, but it was Mashburn again who played hero. He made back-to-back saves to win Michigan the game, and also made a massive save to extend the game after a Mohammed Zakyi. Marcello Borges (#2) holds off Kevin O’Toole (#6). You have to give credit to Princeton’s side as a whole. The first half was about as perfect of a first half you could play in the snow. Jeremy Colvin constantly troubled the two center backs with his pace and strength on top and got free plenty of times. Of course, it was the beautiful through balls from midfield that free him up. Sean McSherry, a senior winger, played the left wing with brilliant pace as well. It was a picture perfect performance by the Tigers, and Wolverines fans have to tip their hat. For Michigan, their kryptonite of speedy and strong attackers did them in multiple times in the first half. The snow seemed to trouble them and they simply could not find any sort of breakthrough between the tough Tigers’ defense. The back line of Princeton held up well and Benjamin Issroff and Richard Wolf were able to snuff out attacks centrally and even draw an aggressive reaction out of Jack Hallahan. It was a crazy game with plenty of chippy tackles, and that did not work to the Wolverines’ advantage in the first 45. But amidst all of that, the season continues. It took serious resiliance and an unreal effort from Henry Mashburn, but the Wolverines prevailed and will travel down to South Bend. Four clutch saves by Mashburn makes him easily the man of the match. He got multiple saves when Michigan needed them. A shootout for the ages, Michigan will move on. Daniel Mukuna’s checking into the match really solidified the back line. He has been outstanding for two full years at center back and proved his worth yet again. The coolness he provides in the defensive third was so important and really helped Michigan find a bit more confidence and freedom in the attacking third. Colvin was contained well and that allowed the rest of the defense focus on the rest of the Tigers attackers. What’s next for the Wolverines? It’s a date with Notre Dame in the round of 32 in the NCAA Tournament. They lost 2-1 at home and will want to continue the “Revenge Tour” that Michigan football and basketball have been on. The game is in South Bend on Sunday, at a time to be determined. It was heartbreak in the Big Ten Tournament finals, but only for 24 hours. Michigan’s spirits were lifted at 1 PM on this Selection Monday when it was confirmed that they would be an at-large selection to the NCAA Tournament for the second straight season. Michigan, also for the second straight year, advanced to the Big Ten Tournament semi-finals, held in Westfield, Indiana. Facing them down were Wisconsin, the second seed in the conference and a side that had beaten them 1-0 in double overtime in Madison, and also lost 4-0 in last season’s BTT semi finals. It took a strong team defensive effort, but it was seen all the way through. Marc Ybarra’s spot kick was enough to be the winner and get through to the final. The defense deserves plenty of credit for this triumph, especially sophomore Jackson Ragen. 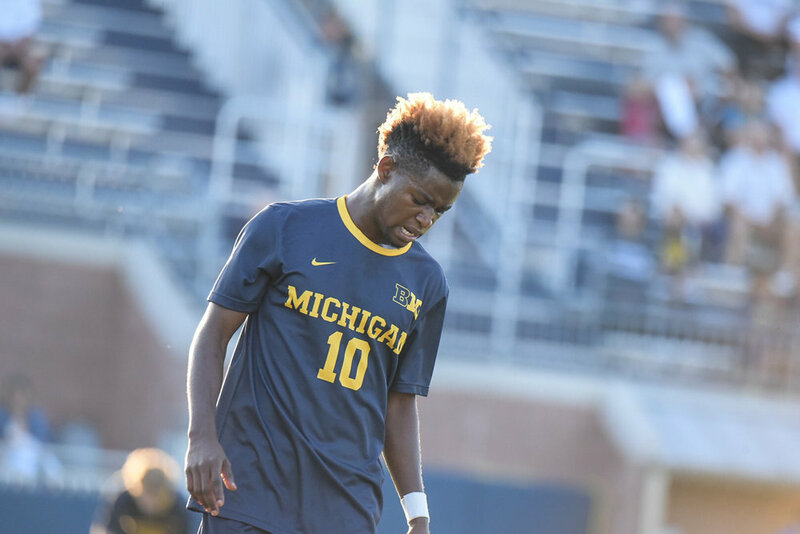 The center back had one of his finest games in maize and blue and his pairing with Abdou Samake has been a promising glimpse into what fans can expect after Daniel Mukuna graduates following this season. Fans also got to see Ivo Cerda return from his long-term injury, giving hope that he will play a larger role in the NCAA Tournament run. Coach Chaka Daley has led the Wolverines to back-to-back 12-win seasons, a first in program history. Indiana proved why they were the top team in the conference with a 3-0 victory over the Wolverines in the final, in front of a red-heavy Indianan crowd. Capped by a pair of goals to stretch the one goal lead to a three goal deficit, it was just too much for Michigan to overcome. The chances that would come so easily against other opposition just could not be found against the strong IU back line and the Hoosiers proved to the Big Ten, and the nation at large, just how dangerous they are. In a solid Big Ten, Michigan seemed to be a solid lock. With an RPI at, as of last update, #36 in the nation, this not factoring in the victory over Wisconsin, things looked comfortable for the Wolverines. Indeed they were as they are the hosts of an NCAA Tournament game yet again. The Wolverines did not get a bye like last season, but will participate in a first round match against Princeton this Thursday and UMSS at 7 PM. Michigan’s region includes teams Michigan has squared off with as the top two seeds, and the NCAA’s leading goal scorer (Denver’s Andre Shinyashiki — 28 goals in 20 matches). Princeton finished the season as outright Ivy League champions with a 5-1-1 record in the league, losing only their season finale to Yale with the conference already decided. The Tigers knocked off Cornell on the road 2-0 when the Bears were ranked #22 in the nation, and also topped NCAA Tournament invitee and MAAC Champions Rider 2-1 in overtime, also on the road. Princeton has leveled out over the course of the season: after a 1-3-0 start, they proceeded to lose just one of their next twelve games before the season-ending loss to Yale. Their overtime record is outstanding having played in OT or double-OT six times, winning four of those and drawing twice. They present a tough challenge for Michigan and will certainly fight to make things tough on Michigan. The Big Ten placed four teams into the tournament as Indiana, Maryland, and Michigan State all join the Wolverines in the bracket. Indiana earned the #2 seed nationally and awaits the winner of UCONN vs. Rhode Island. The Hoosiers are in the Wolverines’ regional and if both teams progress to the regional final, they will square off for a third time. Maryland was named the #11 seed nationally and awaits the winner of North Carolina State and Daniel Mukuna’s former university, Campbell. The Terrapins have not missed an NCAA Tournament since 2000. Finally, Michigan State joins Michigan in hosting a first round match-up as the Spartans play host to the UIC Flames. A victory will send them to #4 overall Louisville. Looking at Michigan’s road ahead, if they top the Tigers they will see a familiar foe in the second round. The #7 seed, Notre Dame, will host the winner of Michigan/Princeton in South Bend. As you may recall, the Wolverines fought tooth-and-nail with the Fighting Irish on October 16th in the match Ivo Cerda received his injury. The Wolverines found an equalizer through some Jack Hallahan magic, but would fall 2-1 with Notre Dame converting a penalty. You can read the entire match recap here. A rematch would be an intriguing match-up with Michigan surely hungry to avenge a wrong. 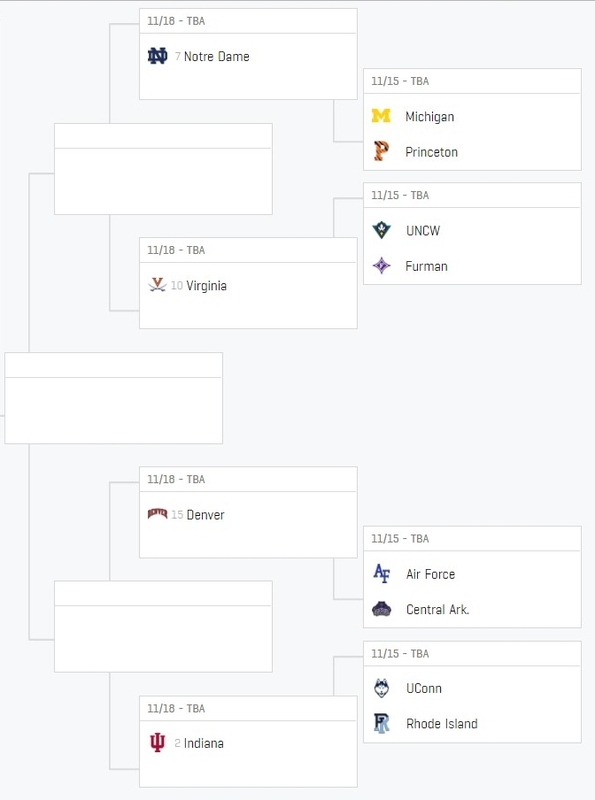 If the Wolverines manage to get to the Sweet Sixteen, they would be looking at either #10 seed Virginia, or the winner of UNC-Wilmington or Furman. The NCAA Tournament offers a very likely final chance for the Michigan faithful to cheer on their favorite players before the season comes to a close. With plenty of tough opposition ahead, Michigan would certainly love the chance to take down a seeded opponent or two on their way to a strong tournament run. As a reminder, the opening round bout is at 7 PM on Thursday the 15th of November at UMSS. Tickets are on sale now, and MSN will have coverage of the match for you as well! Mohammed Zakyi, Michigan’s number nine, is marked by Ryan Gallagher in these two sides’ first meeting. The day after Michigan football’s ‘Revenge Tour’ continued onward over Penn State, Michigan soccer got a measure of retribution after a disappointing 1-1 draw in the two sides first meeting. Michigan dominated throughout the match en route to a 3-1 victory and set themselves up for a date with Wisconsin in the Big Ten Tournament semifinals. Neither side gained an advantage as fifteen minutes came and went with no chances for either side on a blustery autumn afternoon. In the 16th minute, Austin Swiech found Noah Kleedtke who was free, but just took one too many touches and ultimately sent in a cross and no one could latch on to. Still, it was a sign of life and reason for optimism for the Wolverines fans in the crowd. The 29th minute saw Michigan’s breakthrough. Marcello Borges sent in a long throw towards the box in the hope that someone would latch onto it. Umar Farouk Osman was the third man to attempt a play on it, but he did the best with it, drilling it with his favored left foot past a diving Josh Levine in Penn State’s net. Michigan was really running the match during the first half, but Penn State found a late equalizer themselves. In the 43rd minute, second time was the charm for the Nittany Lions. Henry Mashburn sent the first of sophomore Callum Pritchatt’s in-swinging corner kicks away, but the second met Ryan Gallagher’s head from very close range. The Wolverines were stunned immediately before the half and now head to enter the locker room on level terms. Michigan was fired up out of the break and regained the control they had lost for a quick moment. In the 53rd minute, Jack Hallahan’s service off a corner kick found Robbie Mertz, whose back heel toward the mouth of the goal was poorly cleared by the PSU defense. Osman was there at the right place with a rocket of a shot to drill it into the top left corner of the net, giving him his brace. Michigan snagged a third and final (and game-clinching) goal in the 83rd minute from the boot of Hallahan. Lucas Rosendall, on the wing, picked the pocket of Austin Maloney in his team’s final third and got forward nicely, delivering a centering pass to Hallahan. Hallahan had to dance around a Nittany Lion defender in the box, but his shot was dead on and gave Michigan the two-goal cushion with less than ten minutes to play that they so desperately craved. The scoreline would hold at 3-1 in favor of the Wolverines. Umar Farouk Osman had two of Michigan’s goals this afternoon. Michigan was really a class above Penn State this evening, especially when compared to last meeting. Against the Nittany Lions in the regular season, Michigan had trouble with the strength and speed some of the players provided for Penn State. Tonight, though, credit has to go to the entire back line for holding very strong against the Penn State attack. PSU’s two key players who alternated at striker, senior Mac Curran and all-freshman selection Jeremy Rafanello were absolutely silenced when defended by Abdou Samake. On the right, Austin Swiech, for the second encounter in a row, nullified the attacking threat that sophomore Ethan Beckford provides on the wing. It was faultless from the back four and served as a highlight to why this Michigan team is where they are today. Of course, the attack needs their credit too. Umar Farouk Osman was dropped into a central midfield role upon the injury to Ivo Cerda and has taken to it brilliantly. While capable as an attacking midfielder, this new position was a bit deeper than usual. It has not bothered Osman who plays more to the right of the midfield three, which allows him to link up consistently with Jack Hallahan. Speaking of Jack, the Englishman proved why he’s the Big Ten’s Offensive Player of the Year with another goal and assist to his name. His consistent form and moments of brilliance are keys to this Michigan side and will be key to propel them to Big Ten Tournament heights. Finally, Lucas Rosendall put in a brilliant shift on the wing, winning the ball and giving the assist to Hallahan’s goal. It was superb from the junior who really has put in some great work to his past few games as a starter and deserves much credit alongside those in the Michigan line-up for get more than he may. On deck for the Wolverines is a key match with Wisconsin in the Big Ten Tournament semifinals. The match is on Friday November 9th at 3:30 PM in Westfield, Indiana. For those not making the trip, it will air live on Big Ten Network. These two teams met in the same situation last season, the semifinals of the Big Ten Tournament, and Wisconsin ran away with a 4-0 victory. Michigan will hope to right this wrong and get a big victory in the hunt for an NCAA Tournament bid. Senior nights are always full of emotion no matter the sport at the collegiate level. This afternoon was no different, but the bittersweet match had a positive end result as the Wolverines took down Maryland 2-1 in overtime in what was a crucial three points in not just the Big Ten standings, but NCAA Tournament resume building. Michigan started off immediately as the aggressors, with a couple quick chances. Robbie Mertz found Noah Kleedtke well down the right wing in the sixth minute, and Kleedtke sent a cross into the box for Lucas Rosendall, but the winger could not direct the cross into the goal. Additionally, in the 13th, Jack Hallahan showed off his brilliant footwork and slipped Kleedtke through, but the senior could not get proper footing and sent a fairly tame effort at Maryland netminder Dayne St. Clair. The pressure was near constant by Michigan on Maryland. Maryland had seven shots in the first half, including forcing a handful of saves out of Henry Mashburn, but very little actually troubled the Michigan defense, which stood strong. Maryland’s best chance came two minutes after the Kleedtke chance with Paul Bin firing a shot at Mashburn, but Mashburn got enough to keep it out near post. The few chances Maryland did have, though, ultimately amounted to very few that actually troubled Michigan. Michigan would finally get a breakthrough of their own. Rosendall did brilliantly to keep the ball in Michigan possession at the top of his area of the box and then switched wings with Hallahan. Hallahan then sent a brilliant cross into the box aimed at Kleedtke, but the nature of the cross and attempt by junior defender Donovan Pines meant it was directed into the net by the Maryland defender. It was 1-0 to Michigan and would remain that way into the halftime break. The chances for Michigan started immediately in the second half with a three-on-one happening on a break in the 48th minute. Umar Farouk Osman took the ball centrally, sent Robbie Mertz through on the left, and the senior midfielder beat the keeper, but it was sophomore defender Matt Di Rosa of Maryland that made the save with a sliding goal-line clearance. Michigan’s opportunity to double their lead was snuffed out with a brilliant bit of defensive work. Following this, Michigan was put under more pressure by the Terrapins. In the 66th, it was leading goal-scorer Amar Sejdic who forced a vital save out of Mashburn to keep the game level. Then, just two minutes later, Justin Gielen found his fellow freshman Brayan Padilla on the left with only the keeper to beat, but Padilla drilled the shot high and Mashburn was untroubled. Still, these were just two of the opportunities that Maryland got in a more impressive second half. In the 78th minute, all the chances and half-chances by the away team came to a head. Off a corner kick, Sebastian Elney headed the ball in off the post, but it was not cleared from danger. Freshman defender Brett St. Martin was right there for the follow to drill the ball into the net to Mashburn’s right. The Michigan goalie never had a chance, and the goal meant the match was leveled as we’d head into overtime. Overtime took 34 seconds. That’s all Hallahan needed to be slotted through by Robbie Mertz to finish the game. It was a crucial finish for the winger and a lovely moment for the hard-working senior midfielder. The victory meant that Michigan gets another match on their home field and, more immediately, it was a brilliant bit of emotion-provoking joy for the home crowd. First off, the positive: This was an all around solid effort by Michigan to limit Maryland on open play attacking chances. The Terrapins were frustrated often and their attempts to release striker Sebastian Elney, the senior from Florida, were generally for naught as Abdou Samake shadowed him brilliantly. Open play attack opportunities were at a serious premium. A defense that has just allowed 13 goals is expected to be stout but, even when missing two of their typical starters (Daniel Mukuna and Austin Swiech) from injury, this performance under some solid pressure — especially in the second half, and despite allowing a goal — was promising. When thinking about Michigan’s man of the match, Jack Hallahan surely has to come to mind, not even just for that lovely overtime finish. While he may not get an assist for his stellar delivery on the own goal, his ball is what put Michigan up a little over a half hour into this match. His consistent delivery and runs on the wing made him a constant nuisance on the right wing and in a second half where Michigan was a bit more on the defensive, he was a positive force in the attack. Michigan will now host a Big Ten Tournament Quarterfinal match on November 4th against Penn State. An Indiana win was needed for Michigan to propel to the third seed. The win doled Michigan State a defeat, keeping them level with Michigan on points with 14. Because they drew, the tiebreaker the Big Ten uses is conference goal differential, which Michigan holds over MSU +5-to-+3. What is important though is that postseason soccer is coming to UMSS and the senior class are guaranteed one more match on home turf. Marcello Borges has been in outstanding form for the Wolverines. Michigan’s second match against a ranked opponent ended in similar disappointment as the first: a tough one-goal loss. Michigan did very well to equalize in the 57th minute and generally played a strong game, but two lapses in defense would ultimately bury the side against a clinical Fighting Irish team. The game started on a negative note for the Wolverines as senior leader Ivo Cerda went down with an injury to his leg in the early minutes of the match. Cerda would try and continue on, but it was too much for the co-captain and he would see his evening end early. In his place, though, was Mohammed Zakyi making his long-awaited return from injury, albeit earlier in the match than Chaka Daley would have liked. Things would get duller for Michigan in the tenth minute when Notre Dame found the net. It was a long throw from the Fighting Irish that Jackson Ragen’s head found, but not far enough. Thomas Ueland found his fourth goal of the season past Henry Mashburn who could not do anything about the senior winger’s hit putting Michigan in an early hole. Daniel Mukuna would be Michigan’s savior in the 17th with a key clearance on a surging Aiden McFadden. The Englishman was the last man back on defense and made sure the sophomore would not get through. After this, however, Michigan swung momentum in their direction. Mohammed Zakyi had the best chance with a brilliant long shot nearly catching 6’7” Duncan Turnbull off his line and forcing a save. The second half started off with limited opportunities for either side, but as has been the case many times, it was a moment of magic from Jack Hallahan that put the Wolverines of the board. Zakyi found Marcello Borges with one of the finest wing-swapping passes you will ever see. Borges found Robbie Mertz, Mertz found Hallahan who shifted more centrally to receive the ball, and at the top of the box with his weaker foot he found the net in the 57th to tie the match up. Jack Hallahan found the net yet again. Michigan continued to build well, but in the 68th minute it was a lapse in judgment by the generally rock solid Daniel Mukuna who committed a penalty by shoving a man in blue down in the box. Sean MacLeod, a former Rangers youth player and Everton youth trialist, stepped up to take and the senior Scotsman was cool from the spot forcing Mashburn to guess wrong. The goal gave the Fighting Irish the advantage and they would not relinquish. Despite Michigan’s best efforts, include putting Jackson Ragen up top, the chasing Wolverines could not snag their second equalizer and would see triple zeroes hit and receive just their third loss of the season. Michigan were dealt a massive blow early in the match with Ivo Cerda’s injury. The central midfielder is huge in the set-up of the Wolverines and the shift of Umar Farouk Osman to a more central role represented a much more attacking formation as Mohammed Zakyi made his reintroduction to the side with a nice performance on the left wing. He looked sharp and his ball from the right wing to the left up to Borges was the catalyst for the equalizing goal. His play is going to be important in the final stretch and postseason of this Michigan season. It was also another brilliant performance by left back Marcello Borges who has had no problem finding his form after his earlier injury. Borges is composed down the wing and provides an offensive spark at almost all times. His overlapping runs are nightmares for opposing wingers and full backs and the fact that he is great with both his feet makes him difficult for even the best players and he is certainly going to be a strong professional player in the future. The lack of a season-defining win may scare fans, but it should be noted that Michigan do still have some solid teams left on the schedule. Despite just one of the three remaining opponents being ranked, the metric of RPI tells more to the story of the remaining matches. Michigan are now staring at a pair of games with teams in similar standing of RPI — Michigan sit #46, Wisconsin at #64, Maryland at #33. A win over this Notre Dame side who sit #5 in RPI would have been nice, but the upcoming Big Ten matches are what will well and truly define this season. Michigan heads on the road later this week on Friday as 7 PM to take on Wisconsin, who currently sit fourth in the Big Ten. They venture over to the current #13 team in the country Michigan State next Tuesday in the Battle for the Big Bear at 8 PM. Finally, the Wolverines return home on October 28th for the final regular season match of the season, at home at 4 PM against Maryland. Umar Farouk Osman found the net for a team-high seventh time against Detroit. A steady rain was the theme for the evening, but it was not on Michigan’s parade. Michigan trumped Detroit 4-0 in their second-to-last non-conference match of the season. Michigan dominated the opening possession battle, but they were hard pressed to find a clear chance. Jack Hallahan’s deflected shot in the 11th needed a save to tip it over the bar, but no early breakthrough could be found. Detroit looked directly generally playing a 4-4-2 with revolving strikers and center mids while Michigan found their possession generally sustained whatever area of the pitch they wished. It was only a matter of time before Michigan would find the back of the net, and like the Oakland game, it came through a late penalty. Marcello Borges delivered a crisp cross into the box that hit the arm of a Detroit defender. It was taken calmly by Marc Ybarra, who drilled it to the keeper’s right just under the bar. The best was yet to come. Goal number two again started with a Borges cross. While it did not find anyone in maize initially, the deflection meant Sosa Emovon (who came on for Noah Kleedtke with ten minutes left in the half) had a seemingly attempted shot fall right to Umar Farouk Osman. It took a simple finish and Osman found the net for the seventh time this season. There were not too many happenings for the Wolverines or Titans getting forward in the second half, but the half was marked by some Hallahan brilliance. First, Hallahan beat a couple of Detroit defenders through the heart of the pitch and found Kleedtke alone for a one-on-one with the keeper, which the senior converted well. Then a corner from Hallahan met Jackson Ragen’s head and well and truly clinched the game for the Wolverines. Finally, Hallahan got a goal himself. Carlos Tellez, the sophomore midfielder, did outstandingly to bring the ball down at the top of a box and send Hallahan through. From there, it just took a finish from Hallahan. The fifth was the final one and Michigan put on a soccer clinic for the Wolverine faithful. Sosa Emovon’s first point of his Michigan career came in the 43rd minute with an assist. Michigan looked great even in the relentless rain. Marcello Borges really shined on this evening, both goals coming from actions resulting from crosses of his. Borges does so well to position himself in a way to dissuade opposing teams from attacking on the left side of Michigan’s defense while also playing forward well. His first game with bleached hair was a resounding success for the left back. Another player who did all the little things right was Marc Ybarra. His positioning as the final man in midfield is key to this Michigan side. It seemed as if he did not misplace a single pass tonight and won some brilliant tackles that seemed to go unnoticed. His contributions help make this team run smoothly and the trust he has by coach Chaka Daley is clear as penalty taker for this side. Against a Detroit side that likes to play direct, in weather that favors sides that prefer this route, it was up to the Michigan defense to stand tall. They certainly did so, with special credit going to both center backs Daniel Mukuna and Jackson Ragen for dealing with the various central threats Detroit sent at them. With no shots on target for the Titans, it’s a credit to the Michigan defense for yet another dominant display. The two central strikers in today’s match, Noah Kleedtke and Sosa Emovon, each went on the stat sheet while putting in strong shifts for the Wolverines. Kleedtke’s goal is the second of career and required a fantastic run from him to get in proper position. Emovon, on the other hand, clearly has the technical skill and an assist will surely be a nice confidence boost for him. Of course, when talking about attackers, Jack Hallahan’s second half must also be talked about. Two assists, a goal, and at least two more very near chances marked a stellar night for a player who is quickly making a case for at least First Team All-Big Ten honors once again this season. Michigan’s final non-conference match of the regular season is on deck, and it’s a big one. Notre Dame visits UMSS and there is the strong likelihood of another ranked match-up. The match is on Tuesday November 16th at 6 PM. Jack Hallahan was locked in a key battle with star IU left back Andrew Gutman. Indiana, on a chilly fall afternoon, became the team to end Michigan’s nine-match unbeaten streak. Michigan were toppled 1-0 by the #2 ranked team in the country in a battle of the top two teams in the Big Ten. Michigan avoided immediate disaster in the third minute from an Indiana free kick. Timmy Mehl, senior defender, hit the post on a free kick just a yard or two out of the box. Andrew Gutman, the star senior, put in the rebound, but it was ruled out for a handball. It was a close call for the Wolverines, but more defending was to come. Henry Mashburn was busy and called into action several times. In the 29th, Indiana had another golden opportunity with Justin Rennicks’ run through the midfield and shot to Mashburn’s right. It took a key diving save to keep the shot out of the net. Another chance was from A.J. Palazzolo’s header off a cross, but Mashburn got down well to save the shot. Michigan continued to do nice work defensively, but the match entered the half still level at 0-0. The second half was not too different than the first, with Michigan holding the ball wherever they pleased while Indiana looked dangerous on the break. With all the chances Indiana had previously, though, they would eventually find a goal from one of them. Griffin Dorsey slid Rece Buckmaster through as the defender/midfielder ran free on the right wing. He could then slide the ball past Mashburn and the Hoosiers would take a 1-0 lead. From this moment, Indiana was able to play the way they have been (tighter and compact in defense, looking for moments to jump out on the break) but with a renewed purpose. Michigan had a couple of attempts, but nothing truly on goal. Daniel Mukuna’s header off a corner went high in the 66th, Jack Hallahan shot high and wide as well, but nothing seemed to work. Chaka Daley made the move to bring on Abdou Samake for Marc Ybarra, who put in a strong shift, and move Jackson Ragen up top as central striker. It was something different and a change of pace, but it did not result in that elusive goal. Michigan could not find an equalizer and the score remained 1-0 to Indiana at final whistle. Noah Kleedtke continues to start at central striker in place of injured Mohammed Zakyi. Today’s game was dominated by Michigan’s center backs. Daniel Mukuna was faultless in the air today. Indiana looked often to alleviate pressure by pushing the ball up to Justin Rennicks, but Mukuna’s coverage on him was immense and allowed Michigan to keep possession in strong areas regularly. He was calm and cool on the ball, and he played like an absolute star today. Likewise, Jackson Ragen continued his stellar play with a number of key tackles, including a brilliant sliding tackle in the box. The result is not what anyone wanted, but Michigan fans can take the key positive that their center backs remain in top form. The key match-up to watch, perhaps, was a battle of two Hermann Watch List players: Michigan man Jack Hallahan and Indiana star Andrew Gutman. Hallahan was held well by Gutman and quieted more than usual, but he was still dangerous on the right wing and sent in several nice crosses despite the attention from a standout defender. Indiana’s defensive capabilities were on full display throughout the match. They sat back generally while Michigan had the ball, daring them to try and find the holes in their set up. Michigan had a difficult time doing so despite the nice work done in midfield to dictate play. Michigan were happy to hold possession and did very nicely in keeping the ball, but the process of getting the ball in attacking positions is what confounded them. Occasional freedom was found down the wings, but the defensive ability of Gutman and Rece Buckmaster did not make things any easier to develop that way. Indiana’s response to their loss against #4 Kentucky was a resounding one in this match: that the three goals they let in against the SEC was not a common occurrence. Marcello Borges returned from injury to put in a strong shift at left back, playing 70 minutes. Likewise, Austin Swiech did the same after being subbed off in the week at Oakland with a lower-leg injury. In other injury news, Mohammed Zakyi remains out with his own injury. The Ghanaian was in street clothes for the match and Noah Kleedtke got his fourth straight start leading the Michigan line. The hope will surely be that he will be available for the home stretch of the Big Ten season, with three more massive matches remaining. On deck for Michigan is Detroit on October 10th at 7:30 PM. After that, it is six days rest for Michigan then a match with the current #15 team in the country, Notre Dame, on October 16th at 7:30 PM. Those are the final two matches of non-conference play and the Wolverines will surely hope to gain some confidence boosting results from them before the rest of Big Ten play. Marc Ybarra scored the first goal of the match from the penalty spot. On a gorgeous October evening, Michigan defeated in-state rival Oakland 2-1 thanks to a late, late first half penalty kick and Noah Kleedtke’s first goal of his Michigan career. Oakland had the first chance of the match as senior midfield man Jacob Moore had a volley go too high to trouble Henry Mashburn. While Oakland did not have a single shot on target in the first half, their attempts were not bad at all. Outside that, however, the game entered a bit of a lull of back-and-forth action. In the 22nd minute, it was Michigan’s turn to get a chance. Robbie Mertz delivered an outstanding cross to Jack Hallahan who headed on near post. It was Sullivan Lauderdale who was called into action for Oakland, and he answered the call with a stellar diving save. This was Michigan’s best chance for the majority of the half, and it took a fantastic save to stop it. Oakland had their opportunity in the 38th through star striker Nebojsa Popovic. The junior has six assists on the year, but he went for goal himself this time with a chip of Henry Mashburn. It beat the sophomore, but the shot found the post. It was the keeper’s best friend in that moment, and it opened up the moment for Michigan to break the deadlock. Robbie Mertz troubled the Oakland attack with tenacious pressing. Hallahan had a moment of magic in the last minute of the game as he took the ball near midfield and beat at least four players in white before being brought down in the box. Marc Ybarra was given the ball on the spot and Lauderdale guessed the right direction, but Ybarra placed it brilliantly to the keeper’s left, giving Michigan the lead right before the half. The second half was plenty of Michigan chances to start, as shots fired at will from the Wolverines. The maize and blue thought they had a second in the 54th as Hallahan’s curling effort was punched away, but Umar Farouk Osman was offside on his header. Hallahan then crossed another ball in to Ivo Cerda, but his half-volley was saved and held. But Michigan would get their second in a fantastic moment. Cerda had a go in the 61st, but again, Lauderdale was there to make the save. Oakland was not out of the woods, however, and Noah Kleedtke finished with a nice effort. It’s a great moment for the senior who was able to tally his first career goal in yet another productive start leading the line for Michigan in place of Mohammed Zakyi. It was not over, though. Popovic got his goal eventually with a neat turn and finish from point blank range. Celebrations halted for Michigan for the time, and Oakland even had a header off a corner go just barely wide. The final couple of minutes, though, were all Michigan and Hallahan even had a last-minute effort hit the inside of the post. Once the clock hit ninety minutes, Michigan could breathe easily and enjoy the fruits of their labor. Robbie Mertz had one of his finest performances of the season, which is impressive given his consistency this season. Mertz closed down well in defense on Oakland men all night offering them no opportunities to breathe. Oakland found very little freedom through the center of the pitch, and that’s in a large part due to the senior captain’s ability. Ivo Cerda and Marc Ybarra continue to be outstanding in the midfield as well. They are a three-headed monster in midfield and were absolutely vital in forcing Oakland to play wide. Tonight was also a big night for Jack Hallahan who was sparkling as usual. His penalty run was magnificent and even more impressive given the wet pitch. The run from him on the penalty was one of the highlights of his season and his superior quality was on full display against the Oakland full backs. While he was not on the score sheet, it was clear to those in attendance that his attacking attempts were the most dangerous from Michigan this evening. Michigan will need to improve some things still before their clash on Sunday against #2 Indiana. Jacob Moore and Napoleon Outlaw III, the Oakland wingers, found some space on the wings in solid positions. Diagonal balls also found space from Oakland in the gaps of the Michigan defense. Oakland’s goal was also perhaps a bit too easy for them to get into a good position. These are all things Chaka Daley will certainly look to iron out before Sunday’s match. Michigan also has some fitness concerns to worry about before the match on Sunday as well. Austin Swiech went out in the second half after a hard tackle and was on crutches following the match. Declan Gaffney came on for him immediately, and Joel Harrison made his debut in maize and blue after his own stretch of long-term injuries subbing on for Peter Brown. If Swiech is not fit, and Marcello Borges remains out, the two young players could make their starting debuts. Also of note is the fitness of Mohammed Zakyi, who partook in mild warm-ups before the match, but did not enter the match. All three will need their fitness monitored before the match. The game Sunday will be at Michigan at 3 PM in a top-15 match-up. It is surely the biggest match of the season and it will be broadcast on Big Ten Network. After then, it will be a pair of non-conference matches for the Wolverines: Detroit on October 10 and #15 Notre Dame on November 16. Jack Hallahan (#11) and Robbie Mertz (#14) converge on a Penn State attacker. With Michigan’s 3-1 victory over Ohio State, the mid-way point of the season has officially arrived. The Wolverines have cracked the top-20 of the national poll, coming in at #19 in the most recent poll, but with the way Michigan have played thus far, there is no reason to think that the best has already happened. These are the five things that have struck us about the squad at the halfway point of the season. Questions loomed around the program following Francis Atuahene’s departure about whether or not this team would continue to have the consistent attack they did as with Atuahene. The answer to that question has been a resounding yes. Jack Hallahan was named First Team All-Big Ten last season, but he has somehow been playing at an even better rate than last season. Four goals and three assists in just 511 minutes is already impressive, but he offers so much more than that. His first touch is simply awe-inspiring and his delivery into the box, either off a set piece, cutting inside with his left, or continuing a run with his right, is second-to-none. He’s been playing like a star and at this rate will easily repeat his all-Big Ten season. Mohammed Zakyi winds up for a shot against Riverside. The striker has two goals and four assists. Not to be outdone is the man on the left for Michigan, Umar Farouk Osman. Taking the number ten after Atuahene’s leaving, he scored his first career goal against UC-Riverside. Since then, he’s been continually in form with five goals in the last six games. A player of his talent is able to offer up much more than just goals, though. Three assists highlight his delivery, but in terms of things you can’t quantify, Osman’s speed up the left wing has been vital in starting attacks for Michigan. His partnership with Mohammed Zakyi, who himself has been very good as a central striker this season, is simply sublime for Michigan. Hallahan, Osman, and Zakyi combine to make one of the most dangerous front threes in the Big Ten. The Michigan defense is a unit that returned plenty of players and lost only one starter, right back Billy Stevens, after last season, but saw some reshuffling. After a 2-1 defeat on opening day, one of those shuffled positions was at the right back position where Austin Swiech, a midfielder who played just 44 minutes last season, came into the line-up. Since then, Swiech has been the beacon of consistency for Michigan. This season, Swiech has logged his first career goal and over 600 minutes played already. Swiech has covered himself in glory defensively as well as in attack, and he will be asked to do plenty more this season. Jackson Ragen saw a fair bit of action last season, including ten starts, but the trust Chaka Daley has in his young leader is exemplified by the fact that he is the sole outfield player to not be subbed off at any point this season. Ragen is good in the air, understandable given his 6’5” frame, but also does well making forward runs and passing the ball from a center back position. He has all the confidence of a future Wolverine captain and is doing key in the current Michigan side. Lucas Rosendall has been a key man in terms of wing depth for Michigan. Michigan have had to deal with a handful of minor injuries to start the season. The depth of this Wolverines side has allowed those injuries to be dealt with quite well. Lucas Rosendall, junior from Grand Rapids, started in place of Hallahan when the Englishman was not fully fit to start the season. Noah Kleedtke, senior from Brighton and AFC Ann Arbor alum, has featured in every match, but his start against Ohio State in place of Zakyi was well-earned. There are also multiple options in defense with Abdou Samake, a regular starter last season, still just a junior and still solid as a center back, and Peter Brown able to play any position in the back line. Michigan is able to turn to the bench with a multitude of players at various positions, and it’s a great look for them as the season picks up steam. Michigan’s two captains, Robbie Mertz and Ivo Cerda, have been the heartbeat of Michigan soccer in the midfield throughout recent history. The pair both have a goal or two in in them, but where their contributions are appreciated most is in the realm of not just motivational leadership, but on-pitch leadership. Both men roam the field well and playing in front of a deeper midfielder in sophomore Marc Ybarra, it gives them the freedom to operate in tandem. One man can get forward and lead a press when needed and get forward making a key run while the other can hang back and win vital tackles. Both are out-and-out central midfielders who get can forward with plenty of freedom and are quite good technically as well. It can be a bit odd to think of them as ‘unsung heroes’ especially considering they are the two team captains and have started for three of their four years at Michigan (or, in Cerda’s case, all four years) but they can be given how their contributions are very rarely on the stat sheet. Take the Ohio State game for example. Cerda wins a tackle at the halfway line of the pitch and pushes the ball forward to Hallahan on the wing. Mertz, who helped win the tackle, has a brilliant touch pass at the top of the box for Osman, who gets a shot away, has it saved, then buries the rebound. Neither man will get credit for an assist on the play, but without their contributions that goal does not happen. It’s one instance, but it’s representative of just how important both men’s contributions are to the team. An opening match loss against Tulsa may have scared some, but it is a blip in the radar now for this team. Michigan has had plenty of other memorable matches for the right reasons this season. A nationally televised victory, in front of your own fans, over Ohio State, in the pouring rain, is bound to be a highlight remembered throughout the season. One also cannot forget Ivo Cerda’s golden goal against Western Michigan in overtime in a 3-2 victory over their in-state rivals. Michigan also have four multi-goal victories in which they held a clean sheet, showing off the best of both worlds. It’s been a fun season for Wolverines fans so far, but there is plenty reason to believe that there is much more to come. With meetings against #2 Indiana, #5 Michigan State, and #20 Notre Dame yet to come, as well as the always exciting match against Maryland to close the season, all the makings are there for an exciting second half of the season. There was a severe weather delay in the match right before halftime, but Michigan’s goal off a set piece before the match halted temporarily clinched the match in their favor, and they only added to the lead once play resumed, eventually winning 3-1. It was nearly all Michigan from the start of the match. Michigan dominated possession early on, but only had one true clear chance off a shot from Austin Swiech in the 12th. Eventually their breakthrough would come though. It was Jack Hallahan’s very nice in-swinging corner kick, which met Daniel Mukuna’s head and went perfectly past the keeper. It was another early goal from Michigan, who now have seven goals in eight matches that have occurred within the first 25 minutes of play. Michigan pushed forward and continued to make chances. Just two minutes later, Umar Farouk Osman was tackled vitally by Ohio State defender Osman Fofanah to prevent a shot going on target. About 15 minutes later, Hallahan had a go himself with what is turning into a signature cut inside and fire with his left foot, but that shot went just wide. That was in the 38th minute. Just three minutes after, a massive lightning flash lit up the sky overhead and thunder rumbled in the Ann Arbor sky. The game was delayed with 4:18 left in the first half. Fortunately for the leading Wolverines, the game would resume. The final 4:18 were played with no incident, the teams had a quick break, then the second half would begin. Michigan continued to dominate possession and run of play. Xavier Green, freshman for Ohio State, had a go in the 55th, but the shot went high. This really was Ohio State’s best chance of the night before the final ten minutes, and even then would Michigan have their own counter. In the 72nd minute, Robbie Mertz and Ivo Cerda combined to put an Ohio State man off the ball in the middle of the pitch. Mertz continued forward and made a vital run centrally to make himself available. Once he received the ball from Noah Kleedtke, he moved it along just as quickly with a nice flick on to Osman. Osman’s first hit was nice, but a tough effort to finish for even the most experienced player and saved. Still, Osman was quickest to the ball in the box and pounced with a nice finish for his team-leading (and joint-second in the Big Ten) fifth goal. Mertz will not get an assist credit, but his defensive work and final pass were both key in setting Osman up. Henry Mashburn would get thrown into action in the 80th minute and need to make a nice save diving to his left to make a save, and just two minutes later Michigan would yet again respond to an Ohio State chance with a goal. Osman’s touch pass from the wing to Hallahan in a more central position let Jack have a nice touch to put the ball on his right foot and bend it into the net. It was stupendous from the Englishman who chipped a goal onto his earlier assist. Ohio State snagged a goal back through big midfielder Michael Prosuk, but it was far too little, far too late. Michigan would take all three points. The biggest question before the match was how would Michigan cope with no Marcello Borges or Mohammed Zakyi in the line-up. The answer: they’d be alright for the night. It is great for Michigan’s depth prospects that Noah Kleedtke and Peter Brown can both step in and do a job. Tangentially related is Austin Swiech’s performance on the evening as he silenced Ohio State’s sophomore forward Josh Jackson-Ketchup, marking the second match in a row he shut down a key attacking threat (Ethan Beckford of Penn State being the prior player) and this was done tonight from an unfavored left back position. Swiech has been the picture of consistency for Michigan this season, and tonight was no exception. The entire defense was massive this evening and Daniel Mukuna’s goal was a treat for a player who’s been rock solid this season. Seemingly any time the Buckeyes had a chance to send a cross or shot in, Mukuna was in perfect position to play the ball away safely. Jackson Ragen was immense too and the 6’5” sophomore clearly has Chaka Daley’s trust. Finally, we need to mention just how solid Henry Mashburn has been in net whenever called upon. A nice diving save in the 80th is the next in a running installment of nice saves from the sophomore keeper. With three sophomores playing at the best level they ever have in maize and blue, the future is bright for the Wolverines. This was also a night dominated by some of the most skillful players in maize and blue. Umar Farouk Osman and Jack Hallahan both had a goal and assist each as the two wingers put on a show. Hallahan’s left foot is what he’s known for, but it was the right with which he scored his goal. Osman, meanwhile, has gone from only missing finishing in his game to having five goals, most off outstanding finishes (including tonight’s). With Zakyi, they are a well-oiled machine, but more credit to Kleedtke for filling in well on the evening with high intensity to match the firepower of his attack-mates. It’s another three points for Michigan, who venture back on the road Saturday (the 29th) to Illinois to take on Northwestern. The game will start at 8 PM, immediately after Michigan’s football ball against the Wildcats. Following that, Michigan returns to the state of Michigan, but ventures to Rochester to take on Oakland on October 3rd at 7 PM. Three goals in the first half set the tone for Michigan on Monday evening, capped by a wonder-goal from Jack Hallahan, as they downed Marquette by a score of 3-0. The Wolverines were in for a quick couple nervous moments when Daniel Mukuna had to make a key one-on-one breakaway tackle in the fourth minute, then slipped while passing in the sixth minute giving Marquette forward Lukas Sunesson an opportunity. That chance, though, was scuffed it just wide. Despite the early scares, Michigan would have a powerful punch back to the opening body blow. In the 13th minute, it was a bouncing ball outside the box that Austin Swiech followed and struck well. It saw a slight deflection, but it was picture-perfectly hit by the sophomore whose strike found the net. His first goal of the season was stellar, but there was more to come from the boys wearing blue. The very next minute, Umar Farouk Osman did incredibly to maneuver the ball around a few Marquette defenders in the box like a magician fooling an audience and found Robbie Mertz. It was clinical from the midfielder, and it was a quickfire double for the boys in blue. The scoring was not finished yet in the first half. Jack Hallahan in the 29th took the pass from Marc Ybarra and had a go. It looked almost like a cross from the press box, but it had some brilliant bend on it and found the top right corner past a frozen keeper, that being freshman Cedrik Stern. It was an early goal of the season candidate from the Englishman who could not have hit it more perfectly. The goal gave the Wolverines an insurmountable three-goal halftime lead. It was not sealed though, the Wolverines needed to see out the second half. Which they did with some early help from Henry Mashburn. The Honduran keeper was pressed into action with a hard shot from Sunesson, and the sophomore responded with a nice save in the 51st to avoid Marquette from getting back into the match right away. Marquette had a couple of chances, Michigan too, but it was a back-and-forth affair that saw very few clear cut chances. A damper was put on the festivities, though, in the 71st as Swiech suffered an injury to his leg and was removed for the rest of the game, being replaced by Peter Brown. Michigan’s best chance of the half came on a Hallahan effort from a well-taken free kick in the 79th, forcing a save near post to the keeper’s left. In the end, though, neither side could find a second half goal and the score held at an impressive 3-0, putting Michigan’s fourth straight win in the books. This game was brilliant to simply sit back and watch. The three goals from the Wolverines were all pieces of sheer brilliance on differing individual levels: the hit from Swiech, the footwork from Osman, the finish by Mertz after Osman’s shifty moves, and Hallahan’s unreal strike. All sublime pieces of work by some of Michigan’s top performers this season. The goals combined to make a first half that certainly made all Michigan fans proud. Michigan needed about ten minutes to really find themselves in the match, but once they found their legs in the match, they really gave Marquette no chance to match their intensity. Marquette seemed intent on playing from the back and it rarely worked for them. Michigan closed down left, right, and center, capitalizing on even the slightest mistakes to regain position. Even if it was not an error leading to a goal, the pressure was consistently too much for the Golden Eagles. As a whole, despite the individual work on the goals, it was a great team effort throughout the match. Daniel Mukuna and Jackson Ragen dealt well with the threats of Second-Team All-Big East selection last season Luka Prpa and frustrated Lukas Sunesson, the freshman forward leading Marquette in goals, all game. More praise has to be given to Austin Swiech who commands the right flank with authority. He may have a future in midfield, but right now right back is his, and one can only hope that his injury suffered in the second half was minor. The nature of the match also meant Michigan fans got glimpses of some other players who have not received starting eleven levels of playing time. Freshman Sosa Emovon got a nice run out at center striker and offered some very glimpses of what he may offer with his hold-up play and ball movement. Senior Peter Brown also made a cameo for about 25 minutes and did well at the end of both halves to keep Michigan solid in the back line. Michigan finished the game with a wholly different midfield trio than they started with as sophomore Carlos Tellez, freshman Kevin Buca, and junior Joe Hertgen all saw time, with Tellez seeing the most of those three. With Big Ten play on the horizon, and with it coming games with higher stakes, any bit of experience for the younger players of the side will be key in giving Chaka Daley more trusted bench options. Michigan returns to action on the 14th in an away match against Rutgers at 8 PM. From there, the maize and blue have a full week off before return home on the 21st against Penn State. 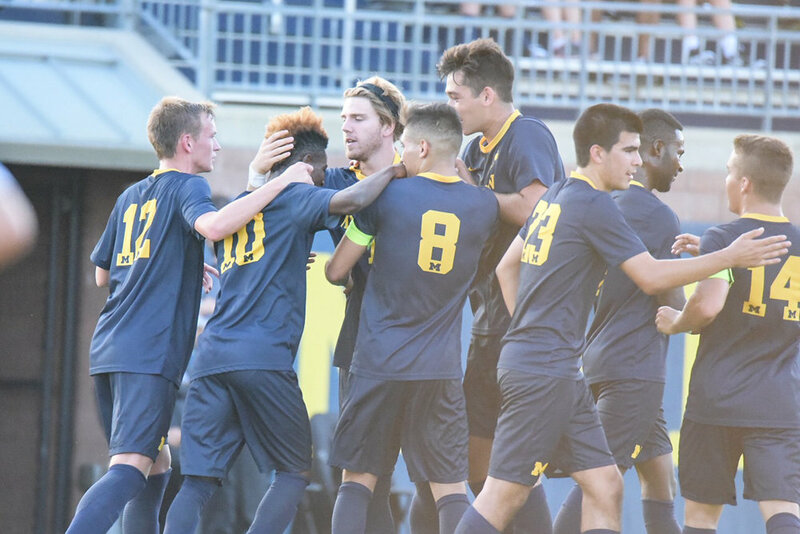 The first official match with students back in Ann Arbor was a success for the Wolverines, as they topped in-state rivals Western Michigan 3-2 thanks to a Golden Goal from Ivo Cerda. The match started well enough for the Wolverines, but no clear chances fell for either side. That changed in the 13th minute when the Wolverines started a break up the left flank, something they did multiple times this match. Robbie Mertz sent the ball in the the box and Osman took the bait. He hit it on target and well with his left foot, but the deflection from a Bronco helped it past the keeper. Michigan were up quickly and well on their way. Michigan continued to pressure the Broncos as they rarely allowed any opportunity for the visitors to feel comfortable with the ball in possession. It almost paid off as Austin Swiech charged forward on the right and sent a one-hop cross in. Mohammed Zakyi played a dummy and let the ball fall for Ivo Cerda, but Cerda sent it tamely into keeper Lukas Von Lienen's hands. Then, the next minute, a poor defensive clearance gave Zakyi the opportunity to send a diving effort at the net, but that was just barely wide. Michigan continued to push forward as Mohammed Zakyi had a pair of strong chances as a result of goalie mishaps. In the 60th minute, Von Lienen could not keep hold of a corner kick and it fell to Zakyi. He had a shot, but was falling backwards and Jackson Ragen's attempt to get a head to it went for naught. The good times eventually picked back up for Michigan. Lucas Rosendall was given a free kick in the 65th after a lovely run in solid territory. Ybarra took the kick and Ragen found it back post and hit it with a nice header. It was picture perfect from the two sophomores and doubled the Wolverines lead. That said, Western Michigan would not go down without a fight. Donovan Michael beat Henry Mashburn in a one-on-one in the 72nd to make it a one goal game and set off a heated finish to the finish. Then, just under ten minutes later, it was center back Ben Thornton whose eyes must have lit up when seeing a loose ball free for his taking to level the game. Just like that, Michigan's lead was gone. Michigan could not take advantage of a handful of late chances, but were given an overtime boost when Thornton was sent off with a second yellow. Overtime was never in question. The Wolverines pushed forward and found a winner seven minutes into the overtime period as Hallahan sent in a brilliant cross and Ivo Cerda got the winner with a sublime finish. It was brilliant from the Wolverines who showed great resolve to bring home a third win in a row. This was a nice effort from the Wolverines, who lost their control for a rough ten minute stretch. They regained their composure after the brief lapse, continued pushing forward, and they never looked rattled. Even with the two goals conceded, there is so much good to take from this match, especially in terms of individual efforts. Starting with left back Marcello Borges, who dominated the left when attacking and defending. He created tons of chances for the Wolverines and his speed proved near impossible for the Broncos to stop. Combined with Umar Farouk Osman on that left, and Michigan have two of the quickest, or perhaps the two quickest, left side players in the entire Big Ten. Tonight's performance was sparked by the rest of the defense just as much as it was by Borges. Austin Swiech, Jackson Ragen, and Daniel Mukuna all had stellar games. Ragen and Mukuna are dominant in the air, Ragen is wise beyond his years as a player, and Swiech has made right back his own. Ragen, in particular, had a stellar performance and his goal is a nice cherry on the top of what was a fantastic defensive day. Additionally, Marc Ybarra continues to influence the game even without seeing tons of possession. Ybarra serves as this side's holding midfielder and is a rock solid link in between the midfield and defense. Michigan showed a 4-1-4-1 at times in defense and Ybarra's ability to close down quickly in the center and not allow many chances through the middle is a huge reason that they are able to use just a single number six. Other notes that Michigan fans will enjoy include Jack Hallahan's health and Ivo Cerda's and Robbie Mertz's continued brilliance. Hallahan played the first half and 15 minutes of the second, and looked solid even if not constantly involved. He's going to continue to play with his usual consistency. Finally, Cerda and Mertz was absolutely crucial in pressing forward and not allowing Western Michigan any room to breathe. The two work perfectly together and Cerda's game-winner is a well-deserved reward for the senior, as was Mertz's assist on the first goal. The Wolverines return to action on Monday, September 10, at 7:30 PM as they take on Marquette. Following that, they play both their first away match and Big Ten match on September 14th at Rutgers. It was another clinical victory for the Wolverines as they downed UC Riverside 3-0 on a lovely Friday evening. Michigan dominated the vast majority of the first half, with the best chance coming from a headed attempt by Mohammed Zakyi after a great cross from Marcello Borges. Michigan pressed forward with a pair of chances in the 18th and 19th minutes as Umar Farouk Osman and Zakyi both had shots just wide. The scoring was there for the taking, and it would eventually come. Jack Hallahan made his first impact almost immediately. Osman made a nice run and had a great attempt, but the shot somehow hit the inside of the post and stayed out. Hallahan was in the perfect position to finish the play with a goal, despite an attempted save from the Riverside keeper Edwyn Gutierrez while in the net. Osman has had a full freshman year with great play and a strong pair of games to open this season, but he's been unlucky when it comes to actually finding the net. That duck was broken under ten minutes after his chance hit the post. Austin Swiech, again playing right back, picked out a running Zakyi down the right wing with an absolutely stellar pass. It was a beautiful pass that started this play, but Zakyi's run to get in place for the pass was nice as well. He shuttled the ball off to Osman, and he finished from close range to double the Wolverines lead, where it would stay into the half. After the whistle, Michigan continued to press via Hallahan; with multiple missed opportunities. That is until minute 58 rolled around, and his efforts paid off. With a hard cross from the right wing, which deflected from a UCR defender and made it 3-0. However, Michigan would not stop the hard press, forcing UCR to play defensively. Their counter not being fast enough to pose a threat for Michigan. Austin Swiech had a bit of a different test than he had against South Florida with the bigger number nine on Riverside, the 6'1" Roberto Garcia-Vargas. But aside from being troubled once early, Swiech was absolutely brilliant for Chaka Daley's Wolverines in defense. Additionally, he had plenty of fantastic passes forward, and his pass setting up the second goal of the match was perhaps the play of the match. He deserves plenty of credit for slotting right into the right back position. The two Ghanaian players continued their fantastic form this season, with special highlights on Umar Farouk Osman snagging his first goal of his career. Both players used their pace to give nightmares to the Riverside back line as they seemed to continually attack in waves. Jack Hallahan continues to work his way back to full fitness, and we would imagine that the match against Western Michigan on September 7th could be targeted for him to make his first start. Michigan's next match is their Labor Day match, Monday at 1 PM against Canisius. Cansius fell to Michigan State this afternoon by a score of 3-2, making it a game late with two goals in the last fifteen minutes against the Spartans. 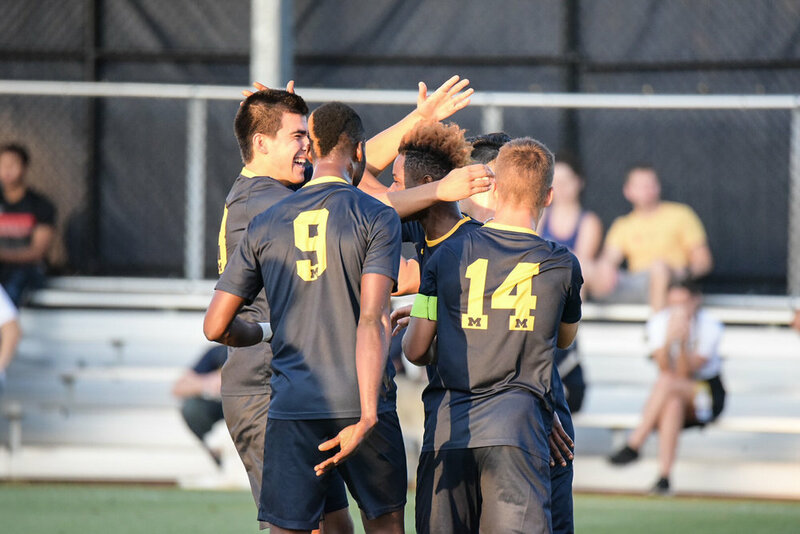 Mohammed Zakyi (#9) celebrates his free kick goal in Michigan's 2-0 win against South Florida. Michigan's second match of the season finds a better result than the first for the Wolverines as they defeat the South Florida Bulls, 2-0. Michigan started the game off better than their first match as, despite a bit of back-and-forth, they saw a good amount of possession and a handful of chances, getting close with a pair of chances, albeit, a pair of chances that were ultimately ruled offside. It did not take too long for Michigan to strike first. In the 20th minute, sophomore striker Mohammed Zakyi, off a dead ball, found the net for the second straight game. Umar Farouk Osman was brought down on the left side of the pitch, and Zakyi curled the free kick past the keeper. Michigan was given the early lead and the opportunity to play with the lead. The opportunities continued for the Wolverines as Robbie Mertz had a nice shot inside the box saved. Just minutes later, Austin Swiech, getting his first career start at right back, sent a long throw into the box that met Jackson Ragen's head, who just went wide. Robbie Mertz (#14) fires a shot at the South Florida net. Michigan were given a massive boost in the 42nd as, again, Osman was taken down by Gallina and, again, Gallina saw yellow, sending him off and forcing the Bulls to play with ten men the rest of the way. It's a credit to Osman, as both cards shown to Gallina were a direct result of some great skill by the Ghanaian. The second half saw plenty of the same from Michigan as they tacked on a second goal just thirteen minutes into the half. Marc Ybarra found Jack Hallahan on the right wing with a fantastic cross field ball. Hallahan's cross was sublime and Mertz directed the into the net with a nice header. The Wolverines lead was doubled, and they would not give up the lead. Even with the lead, Michigan continued to press on with some good chances. Swiech's cross in the 68th minute found Zakyi in the middle, but the game's first scorer could not tack on a second as his header was aimed down into the ground. Zakyi had another near chance in the 73rd, but could not bring the ball down with his right foot. South Florida could not threaten the Michigan defense in the later stages of the match as Michigan continued to hold the ball well. Freshman Sosa Emovon made his debut and looked threatening in the second half alongside Osman. 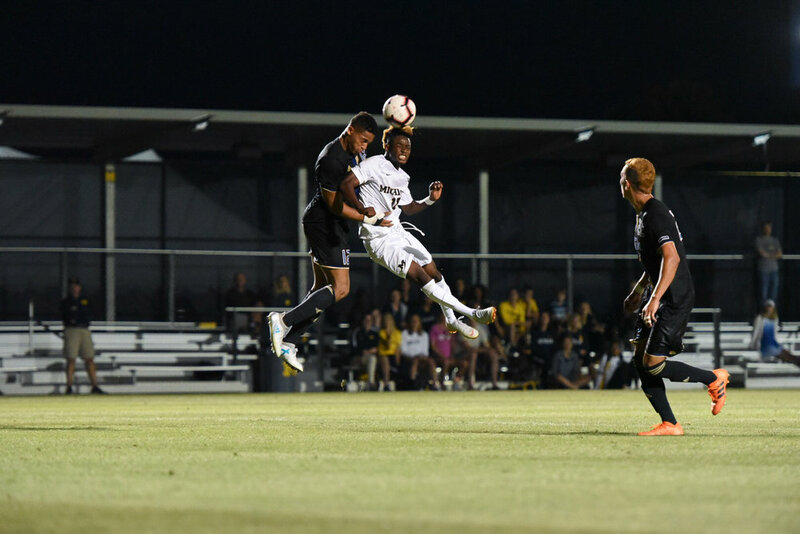 Chaka Daley also handed season debuts to midfielders Carlos Tellez and Joe Hertgen in the late portions of the second half, but Michigan dominated the ball and was happy to see out a 2-0 victory. Michigan was in firm control of this match throughout and held it in all aspects of the match. As opposed to the first match, with Tulsa's pace troubling the defenders and putting pressure on the midfield, South Florida allowed more of the ball to be at Michigan's feet. That let the boys in maize and blue build up in possession while picking and choosing their spots of attack. Mohammed Zakyi, for the second match, has found the net via dead ball. In addition to his fantastic delivery, he continues to make runs, show skills, and create chances that certainly have to make him a focus for opponents from here on out on the scouting report. It's a weapon that Michigan have the skills to execute perfectly with as Osman's shiftiness will certainly see many frustrated opponents stop him by fouling out of necessity. With Daniel Mukuna out suspended as a result of his red card, heads turned to the reshuffled defense. Austin Swiech, the sophomore listed as a midfielder, was slotted into the right back role instead of senior Peter Brown, and the Jenison native played well with strong attacks down the right wing, but also covered himself in defense well. Likewise, Abdou Samake's debut was a success as his quickness moving in the back line is a nice compliment to Jackson Ragen's physical ability. The addition of Swiech and Samake proved smart from Chaka Daley as Michigan held a clean sheet in their first victory. Another story of the match is Jack Hallahan's increase in play time as he works back from injury. Seeing just about ten minutes at the end of the first half in the season opener, Hallahan saw about 40 against the Bulls on the right wing. He looked dangerous as ever with just a bit of rust. The hope will certainly be that he's 100% within the next week or so. Michigan's midfield was key in the match as well. Marc Ybarra, Robbie Mertz, and Ivo Cerda all saw plenty of the ball and did well to try and find ways through the Bulls defenders. Ybarra's brilliant ball to Hallahan set up the cross that led to the second goal, while Mertz deserved a goal for his strong efforts pushing forward and leading the side along with fellow captain Cerda. Both seniors are outstanding leaders who organize the side very well through midfield, especially when pushing forward. Combined with Ybarra, who, despite being a sophomore, leads from his deeper midfield position, Michigan have plenty of leadership on the pitch at all times. With a win in their pocket, Michigan will be a bit happier following this opening pair of games. Up next for Michigan is another set of Friday/Monday games before classes resume. Michigan welcomes Cal Riverside on August 31st at 7 PM before their traditional Labor Day match on September 3rd, where the Wolverines will welcome Canisius to Ann Arbor at 1 PM. The season opener for Michigan saw them suffer heartbreak as they fell to Tulsa 2-1, who were buoyed by two first-half goals. Michigan found themselves on the defensive almost immediately and keeper Henry Mashburn was forced to make a save on a free kick in just the second minute. The pressure paid off for Tulsa and in the eleventh minute they found their breakthrough. Juan Sanchez did well to dribble through the Michigan back line and with Mashburn coming out as the last line of defense, Sanchez finished with a chip to put the visitors ahead. Michigan thought they found an equalizer the next minute as Ivo Cerda headed Mohammed Zakyi on and he found the net from long range, but Zakyi was ruled offside much to the dismay of the Wolverine faithful. But Zakyi would not be denied a goal. Robbie Mertz was brought down just outside the box and Zakyi took the free kick. He did brilliantly to place it straight into the bottom right corner to level the score at one a piece. Michigan was the more positive side for a spell following the goal and forced a couple of saves, both off set pieces. The first was off a Peter Brown free kick while the other came from a Jackson Ragen header off a corner. Despite this, it was Tulsa who closed the half on the front foot. Declan Gaffney made a key tackle on Sanchez in the box to force a corner, but the corner met the head of Joe Ruiz who looped a header past Mashburn to give Tulsa the 2-1 lead just before the half. The second half was a tale of flurries for Michigan, but no luck. The first came in the 60th minute when Ivo Cerda had a shot saved by Cooper Clark in net, then Lucas Rosendall's follow-up cross to Umar Farouk Osman was headed clear, before finally Cerda's second effort was saved and held. The next set of chances saw Noah Kleedtke attempt to find Osman, but that was cleared vitally by Tulsa's Gustavo Vargas, or else Osman surely would have found the net. The corner that followed found Ragen's head as he moved closer to the penalty spot, but his effort was just wide. Kleedtke had the best chance of this spurt, though, as he tried a chip, but again, the Tulsa keeper came up with a key stop. Michigan were dealt an 81st minute blow as Daniel Mukuna was sent off for a second yellow as he attempted a last-ditch tackle. The home side chased an equalizer while valiantly defending, but could never find that second goal. Jackson Ragen's last second effort was too tame to trouble the keeper and Tulsa walked away with the season-opening victory. There is no reason to panic yet about the Wolverines suffering this early season defeat. All four of Michigan's defenders were returning players, but Peter Brown saw most of his time at left back last season, not on the right as he did tonight. There was also a more unfamiliar center back pairing as Daniel Mukuna and Jackson Ragen got the start together. Additionally, the Tulsa attack threatened with pace all night and it made things difficult on the new starters. Sanchez was menacing on the attack as his speed and trickery allowed him to finish nicely on the first goal while his speed forced the corner kick that led to the second goal. There were plenty of positive notes to take from this match as well for the Wolverines. Zakyi was constantly threatening to the Tulsa defense and he created plenty of great chances. His goal was thoroughly deserved and an obvious high point of the night. His country mate, Osman, also lived up to the number ten shirt as well as he demonstrated some great skill at times with a tough match up against Tulsa's senior outside back/midfielder Munashe Raranje. Despite standing just 5'8", Osman was able to snag a couple headed chances for Michigan and looked to have plenty of potential to continue development as his season continues. Matches like this are also nice to gauge what sort of line-ups coach Chaka Daley plans on using throughout the season. We saw Brown get the start on the right and play some strong defense to snuff out a handful of Tulsa attacks. Noah Kleedtke was also the first striker off the bench coming on for Zakyi and he made his presence known with perhaps the best chance of the second half. Declan Gaffney was the only freshman to see playing time at left back and he also was impressive. His speed looks like it could be a great option on the left flank attacking wise to go with tracking back as well. Michigan will have to make sure to get past this setback and not allow themselves to dwell too long. They suffered a handful of disappointing results early last season as well, but of course their Big Ten season was what defined the team. They will get their chance to make amends as they square off with another side from the American Conference, South Florida, at 7 PM on Monday. The first regular season match of the year is just over a week away for the Wolverines, and that means it is time to get back into the soccer state of mind. The University of Michigan is coming off a landmark season with a regular season Big Ten Championship, the first in program history, and their second NCAA Tournament appearance under head coach Chaka Daley. Despite the losses of Francis Atuahene to the MLS Draft and Billy Stevens to graduation, the Big Ten will remain onred alert as those two starting roles will likely be filled by a pair of prospects as a continuation of the youth movement that the Michigan Soccer program has been happy to see develop over the course of last season. Underclassmen already surely locked into a starting role include midfielder Marc Ybarra and forwards Umar Farouk Osman and Mohammed Zakyi. Ybarra is coming off not just a season worthy of a spot on the Big Ten All-Freshman team with the Wolverines, but also an exceptional year with the NPSL’s AFC Ann Arbor, a side that won the NPSL Midwest Great Lakes Conference for the second straight year. He earned acclaim as an NPSL all-conference selection as the heartbeat of that midfield and one would reasonably expect much of the same from him in his second year with the University of Michigan as the deeper number six in the Wolverines’ midfield. Umar Farouk Osman is one of two Ghanaian sophomores ready to lead the Michigan line this season. Looking at the two sophomore forwards, it seems clear that both will be crucial to the side this season. Zakyi battled some fitness concerns early in the season but recovered to the tune of six goals and four assists in the 16 games he played. Michigan Soccer’s number nine has the strength on top to fend off center backs but also enough pace to get behind them and it seems to be a sure thing to see him leading the line for the Wolverines. His country-mate, Osman, was a choice to the Big Ten All-Freshman Team and had a strong season, but the Wolverines will hope for even more from their new number ten, especially in terms of end product. Osman would not have been given Atuahene’s number if big things weren’t expected from him. He seems to be a shoe-in to replace Francis in the starting eleven, most likely on the left side of a front three. The other hole in the eleven for Michigan is at right back with Billy Stevens’ graduation. Perhaps the most probable man to replace him in the starting eleven, and the man who was given the number four shirt upon its opening, is another sophomore, Joel Harrison. Harrison missed the entirety of 2017 with injury but his first season in maize and blue could see him play a key role. Despite being perhaps a bit more comfortable at center back, Harrison was recruited to play both center and right back. He stands 5’11” and his skill set from the time spent at center back should translate over to being a similarly strong defender on the right. Harrison has experience in the USL with the Vancouver Whitecaps 2 where he made four appearances and also was a member of the Canadian U-18 National Team. Right back is one of the more interesting positions to watch on the Wolverine side, but Harrison looks to have the skills to make it his own. Jackson Ragen (#25) will hope to carve out a space in the Wolverines' eleven as a sophomore. Two more sophomores seem to be vital to the campaign: keeper Henry Mashburn and defender Jackson Ragen. Both of these men will likely be in positional battles but either man could come out on top of their respective battles. Mashburn finished the season as the starting goalie for the Wolverines, but junior Andrew Verdi will certainly be in contention for the starting spot. This figures to be the position that is still the most ‘up in the air’ with the Wolverines and could continue to take shape as the season progresses. Ragen, like Harrison, also has experience in the USL with an MLS second team (Seattle Sounders 2). Jackson saw time in 16 matches, starting ten, and snagging a goal as well, last season. He stands 6’5” and while he played holding mid and center back last season, he is listed only as a defender this season and is listed 15 pounds heavier than last season, a good sign for the Wolverines who would love to see continued physicality from their young defender. Abdou Samake and Daniel Mukuna were so solid when both were fit last season and they figure to be the first-choice pairing next season once again. Still, Ragen should certainly be able to contend for play time and see a good amount of it. Covering this stellar sophomore class can almost make one forget about the incoming freshman class which is also strong. Derick Broche should be able to immediately be an option for Chaka Daley off the bench at the number nine role when Zakyi needs a rest. Another one to watch is left back Declan Gaffney who comes to Michigan as a top-60 recruit in the nation and seems set to be the heir apparent to the left back mantle of Marcello Borges. There is also midfield depth as a result of the class in two Michiganders, Saline native Aidan Nam and Kevin Buca from Rochester. This Michigan Soccer program is one that is built to last. The youth of this team does not mean they are an inexperienced group. They return nine of the top eleven minute-getters from last season and two of the three top scorers. The growth from the 2016 to 2017 seasons was nothing short of exceptional, but the sustainability of this team is the primary reason for Michigan soccer fans to be smiling this season. 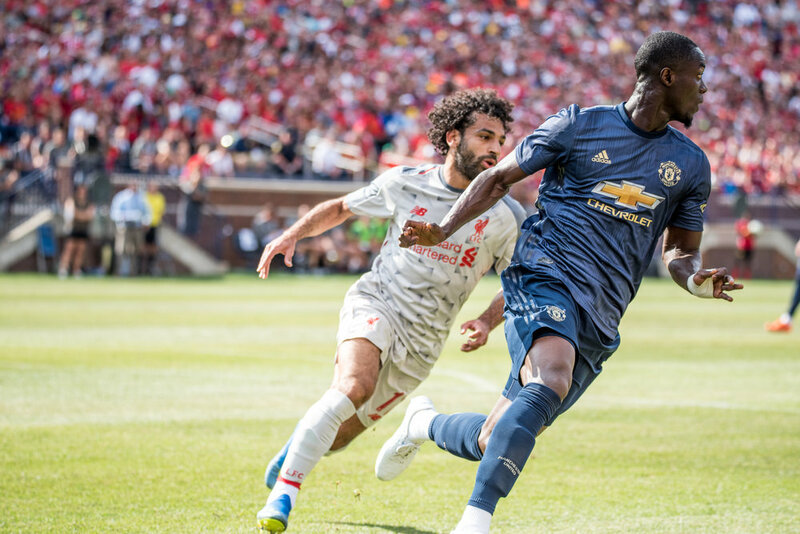 We at MSN were lucky enough to cover yesterday's ICC match between two Premier League and world football giants, Manchester United and Liverpool. United supporters went home disappointed, as Liverpool's supporters flooded the streets singing 'You'll Never Walk Alone' all the way home. 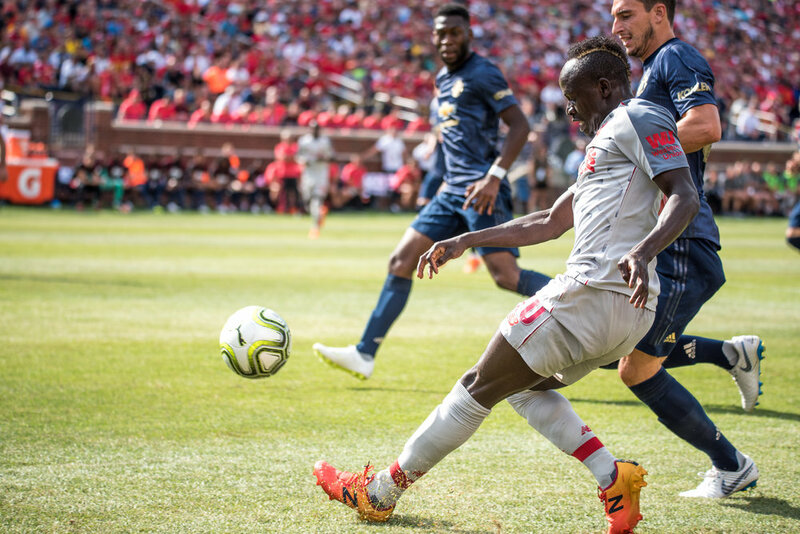 Here's our take, from a staff Liverpool supporter, Ryan Makuch, and staff Manchester United supporter, Michael Kroodsma, on what went down at the Big House Saturday evening. 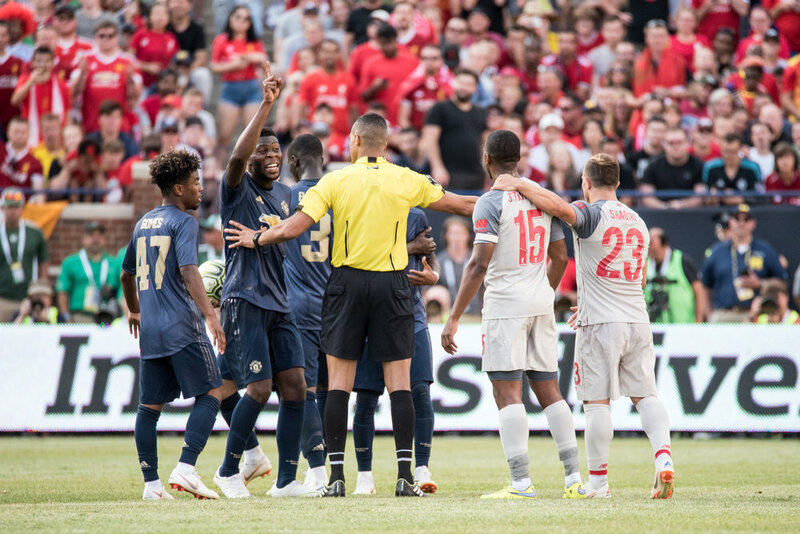 The International Champions Cup returned to Ann Arbor for the third time in the past six years bringing with it England’s biggest rivalry in the North West Derby between Liverpool and Manchester United. The ICC is, of course, no stranger to Michigan with this match marking the third consecutive year a match was played in Michigan (2016 & 2018 at Michigan Stadium, 2017 at Comerica Park). United were no stranger to the Big House, as their previous encounter with Real Madrid in Ann Arbor back in 2014 broke the record for highest attended soccer match in the United States (109,318). It was an atmosphere like few other sporting events as over 100,000 fans packed into the home of Michigan football to welcome their favorite sides. 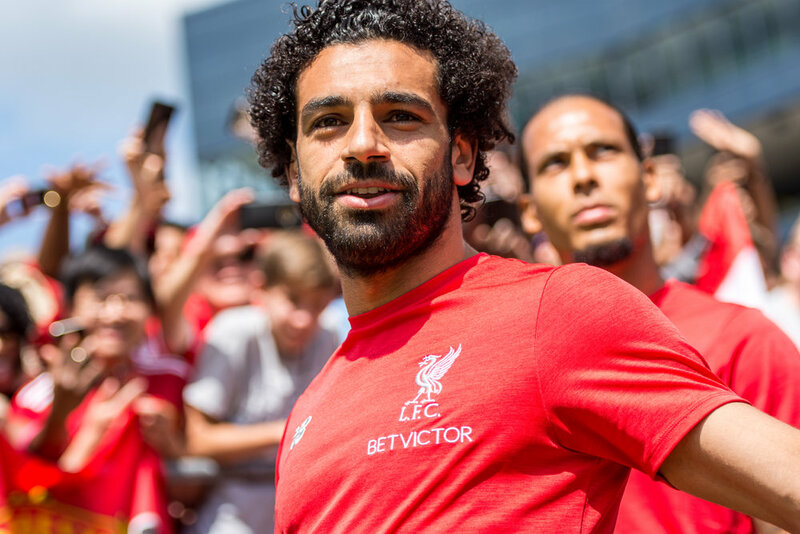 Whether it was the roaming Liverpool fans cheering ‘Allez, allez, allez’ in the concourse, or stars like Mo Salah, David De Gea, and even Jose Mourinho getting massive receptions when stepping out onto the pitch, the pre-match atmosphere was electric as fans packed the player entrance of the stadium just to get a glimpse of their heroes. When it came to the match, however, it was Liverpool fans who got the most joy out of their afternoon. In the first half we saw a Liverpool side that was close to full-strength despite Naby Keïta and Loris Karius both missing out through injury. United, on the other hand, had a few stalwarts like Alexis Sanchez and Juan Mata in the line-up, but featured plenty of young players as well. The first half saw Liverpool dominate possesion and run of play. Mo Salah came close from a header which was saved well by United’s new back-up keeper and former Stoke City player, Lee Grant. It was Salah who was brought down in the box to earn Liverpool a penalty kick and Sadio Mané found the bottom corner to grant Liverpool a 1-0 lead. 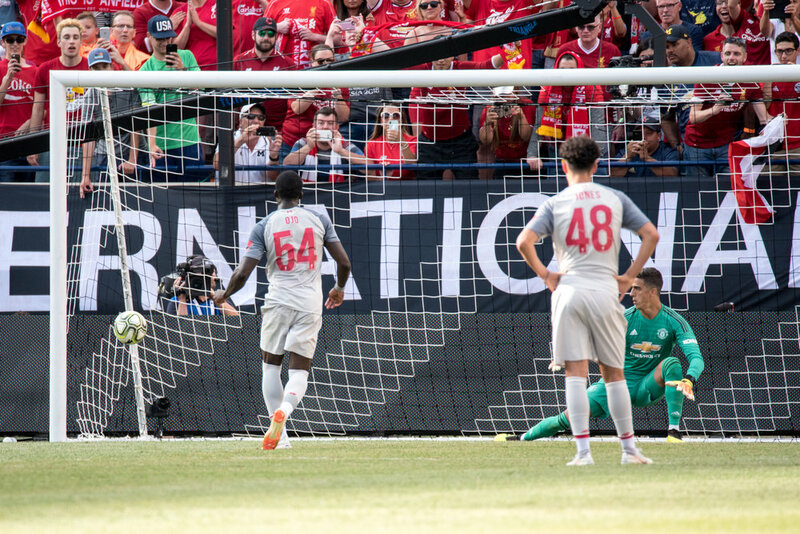 United who struck back courtesy of a stunning Andreas Pereira free kick as he froze Liverpool’s young keeper Kamil Grabara with a picture-perfect attempt. It was 1-1 at the half with the story being that Mourinho’s United were playing like Mourinho’s United while Klopp’s Liverpool were playing like Klopp’s Liverpool. 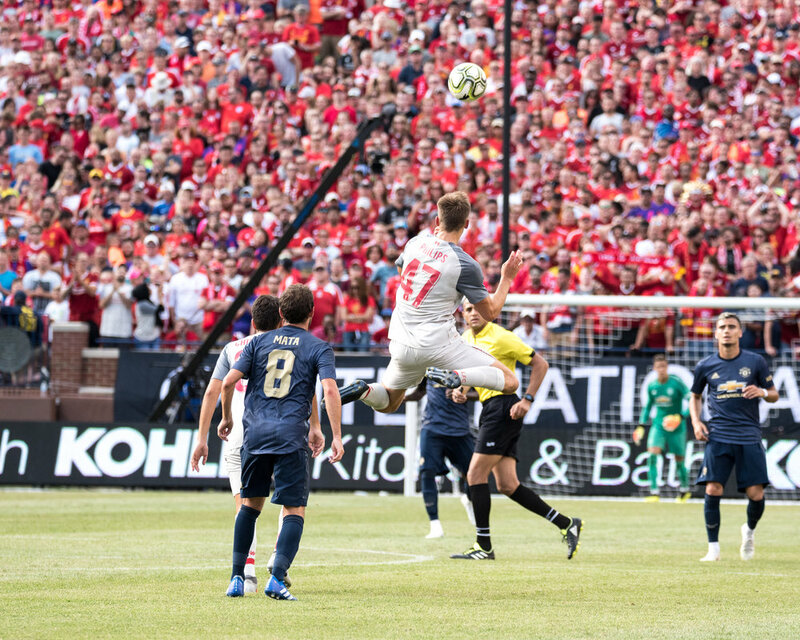 Fans were seeing these two teams do exactly what they were known for as United played smart defensive soccer hitting on the counter as Liverpool tried to push the tempo. The second half brought the fireworks. Once Liverpool brought on the fresh legs of Daniel Sturridge, things changed quickly. 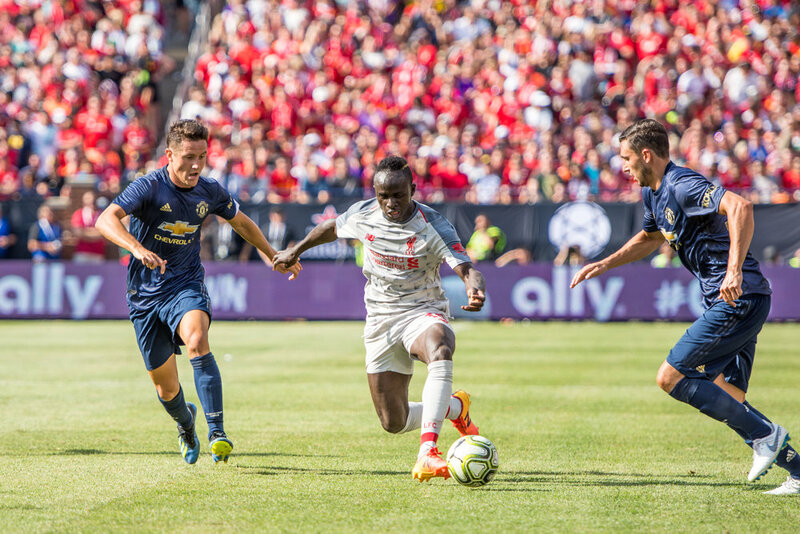 Xherdan Shaqiri’s impact, too, was immediately felt as he brought down a long ball, held off United’s Eric Bailly, and found Sturridge who slotted the ball coolly into the net as he continues his brilliant preseason form. 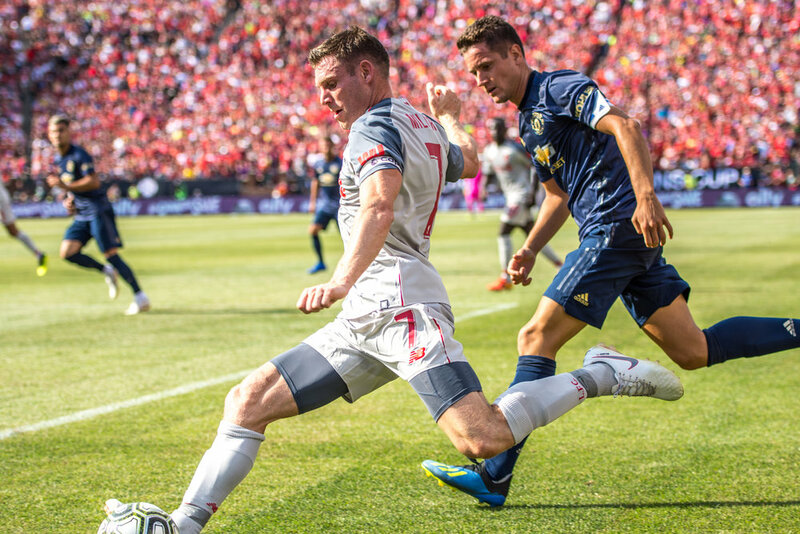 The party continued when Andy Robertson, Liverpool’s fan favorite left-back, was brought down in the box and winger Sheyi Ojo beat United’s Joel Pereira in goal to make it 3-1. If these 3 goals were Liverpool building up to something, the 4th was the showstopper. Ben Woodburn, Liverpool’s youngest ever goal scorer, earning that achievement back in 2016, clipped in a cross into the box seemingly to see if anyone could deliver. Enter Shaqiri. Liverpool’s new man leapt into the air, bicycle-kicked the ball with his favored left foot and found it a home in the back of the net. Fans of both sides could only stand and applaud -- though Liverpool’s fans certainly did so with more vigor. 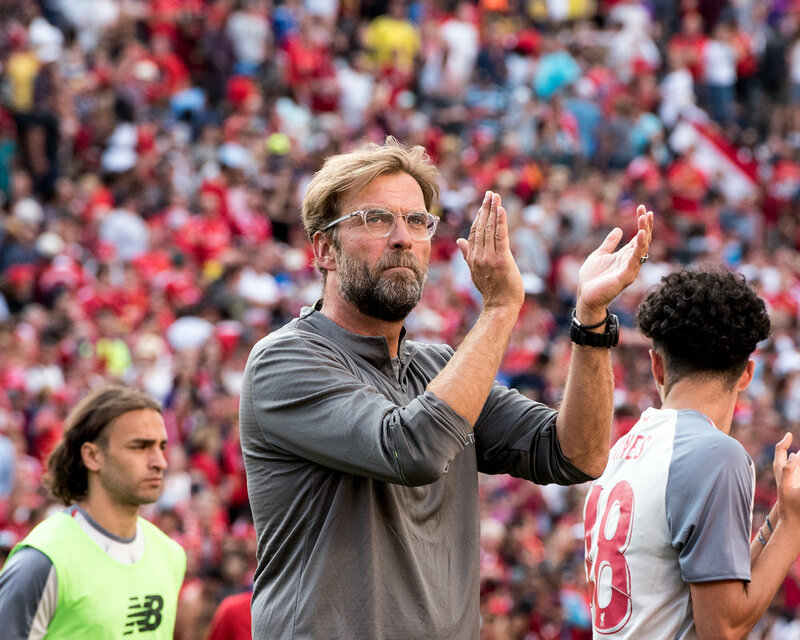 It was an exclamation point to what was a rousing success in Liverpool’s final match in the United States this year. line is quite telling and one they will hope to work past. Jurgen Klopp’s men had a performance to be proud of. Shaqiri stole the headlines with his beautiful bicycle kick and a top-class assist, but there were plenty of other strong performances against an admittedly weaker-than-normal United side. Mo Salah, Sadio Mané and Adam Lallana all started and all looked incredibly smooth on the ball. Virgil van Dijk remains immense in the air and an absolute rock in defense. Young right-back Rafa Camacho continues to impress with the first team and surely will get opportunities at the U23-U18 levels at his more favored right-wing. Sturridge provided a glimpse of his old form for a side who would love to have an outstanding back-up striker behind Roberto Firmino. No matter what team you support, and regardless of feeling about the result, what is clear that the event was a rousing success. An official attendance of 101,254 marks what is another well-attended soccer match in Ann Arbor in the biggest stadium in the country. 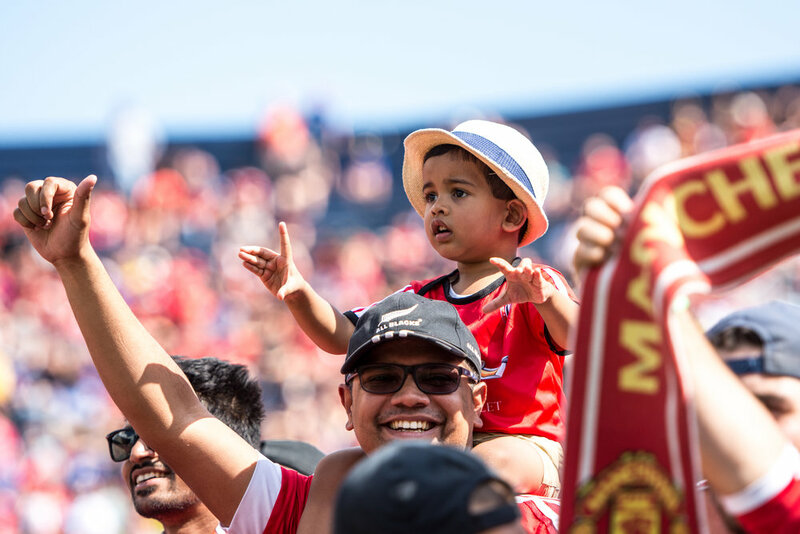 Michigan is developing into a soccer hotbed in the Midwest with strong support for local, collegiate, and international levels of soccer alike. 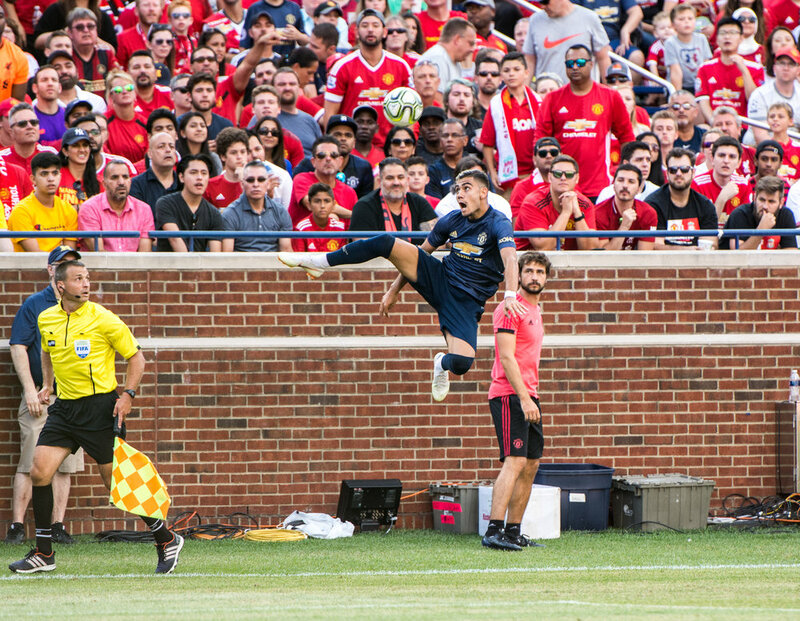 Well, what can I say about the performance that Manchester United put in against Liverpool at the Big House in Ann Arbor on Saturday? I know, I know. It’s the preseason, and sure there’s about a full starting elevens worth of players missing from the side. But that’s not what concerns me about the 4-1 embarrassment that Liverpool laid on United. Some credit has to go to Liverpool for the result, because they were ultimately uninspiring throughout, so to score 4 playing the way they did is some feat. Two penalties tucked away, Sturridge hits the post (which on the day went in, but any other day could deflect a little differently and stay out) and then there was the goal from Xherdan Shaqiri. Shaq‘s goal was special, and it’s certainly the best goal I’ve ever seen in person. That will live long in the memory. I stand by my initial assessment when Stoke went down at the end of last season that United should have signed him. Despite that moment of brilliance, though, Liverpool didn’t offer much else. It came as quite a shock to me when at the end of the match the statistics flashed across the big screen in the stadium and I realized Liverpool had managed 15 shots in the match and 9 on target. It didn’t feel like that at all. Sadio Mané was the only dangerous player for Liverpool, and he made Matteo Darmian look foolish on several occasions (more on that later). 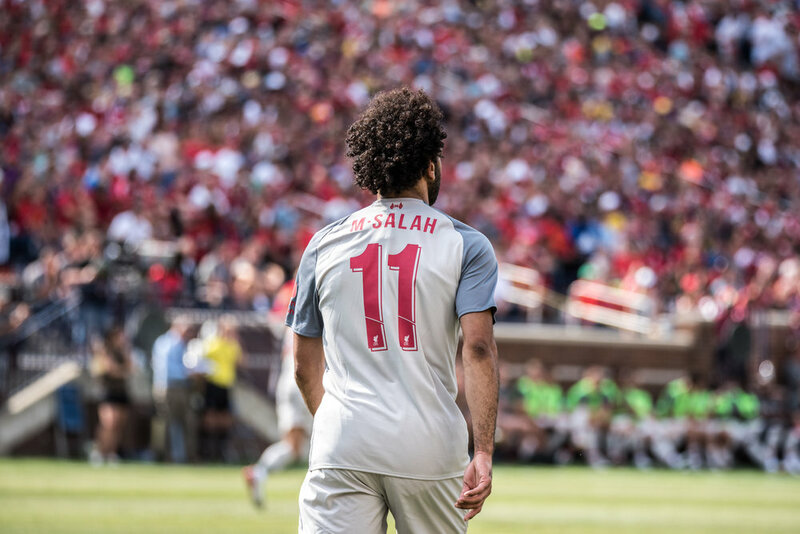 Mohamed Salah, other than stealing the hearts of 101,000 fans, didn’t offer much going forward, despite winning the first penalty. Again, I’m aware it’s preseason, so most of the lads out there that are established first team players for either side were going 65, maybe 70 percent. But my feeling is that this was a winnable match for United, if they had gotten their tactics right, which they absolutely did not. As for United, I don’t know where to start with this lot. Mourinho is intentionally sabotaging this preseason to try and squeeze more signings out of the Glazer/Woodward contingent. That’s the only logical explanation for how negatively we’ve set out in each match of this preseason in the US. I mentioned Darmian, who’s an easy target to lay some blame on, simply for how many times Mané walked past him yesterday. In truth, it’s his position that worries me. Our wing backs aren’t good enough. I think this could be a problematic position for United all season if it’s not sorted out quickly, and Mané evidenced this several times on Saturday. Moving further forward - I feel bad for Alexis. He runs his socks off every match, doesn’t have the support around him going forward, and then ends up looking to so many United supporters like we've wasted money on signing him. The reality is he is an extremely talented player who would thrive with even one other pacy, skillful winger on the opposite side of the field to draw some of that attention away from him and free up some space for him to attack. Alexis had another tough go against Liverpool, despite the mostly positive preseason he’s been having. This match was typical of Mourinho, tactically speaking. We set up to lose. We held on to possession for too long, with no aim or direction, and we didn’t make the most of the 2 or 3 chances we did get from open play going forward. Things will need to change quickly, or else it’s going to be another long season for United in 2018-19. He’s been the best United player on the tour so far, and particularly in this match. His free kick was superb. What I love about Pereira is that he has gone off to Spain for a season, played well with Valencia and has come back to prove a point. I really believe that he’s earned a spot in the side for this year. He’s a talented player with a bright future and he’s willing to work hard for the club. You have to love that. Not too much can be said about Fred’s 20-odd minute debut, but I think that he will be a key figure for us this season. It was cool to be there and see his first touches as a United player and I’m looking forward to big things this season from the Brazilian. I actually felt Liverpool were more dangerous in the 1st half, and Grant looked sharp throughout. He’s a strong, confident keeper that probably won’t see the pitch more than once or twice this year, but if Romero gets injured, Grant could fill in well. Credit to Liverpool for winning the match. They were easily the better side throughout. United will have a long season ahead if the tactics don’t change, regardless of who’s in the side, because there isn’t a team on earth that could play that disconnected and negative and still win. I’m very nervous that there’s more like this performance to come, especially with our key players expected to miss the start of the season. Hopefully things change quickly for United. Marc Ybarra, the University of Michigan Wolverines midfield maestro, is keeping his talents close to home this summer as he prepares to join up with the NPSL's AFC Ann Arbor. The side is a natural fit for Ybarra, an Ann Arbor native, and in fact it was AFC Ann Arbor that Ybarra trained with in preparation for his first season in the Maize and Blue. "Last summer Marc came in to train with us a few times." said AFC Ann Arbor Head Coach and Sporting Director Eric Rudland. " [...] it seemed a natural transition for us to build him into the team for the 2018 season." It took Ybarra just a few short games to settle in with the Wolverines in his inaugural campaign. By season's end, Ybarra was a regular in the starting XI. Traditionally deployed as a deep lying midfielder by Daley and Co., Ybarra is strong in the tackle and reads the game extremely well. His defensive eye will bring a lot of stability in front of an already solid AFC defense this season. Rudland agrees. "He is a natural #6 with the technique and intuition to act as the heartbeat of the team during build up play." he said. "Marc doesn't always get the credit he deserves for his help during team defensive phases". For the Wolverines, Ybarra showed flashes of his attacking capabilities as well. He thrives with pace around him on the wings and found a lot of success playing incisive passes through opposition defenses. His ability to understand the players around him and their movements led to some great moments for the Wolverines throughout the 2017 campaign. Coach Rudland will be expecting to see more of the same from a player whose ability to settle in quickly is equally important as his ability to impact matches. "He was a mainstay in Michigan's lineup this past fall as a freshman, which speaks to his ability to step into a new environment, win a job and flourish with good players around him." said Rudland. "We expect him to do the same with us this summer." We all know that Marc Ybarra is a very talented player. At only 20 years old, it stands to reason that Ybarra has many good years ahead of him. We've seen what Coach Rudland has done at AFC Ann Arbor the past couple seasons, and molding young players is a definite talent of his. Playing in his home town, with the local support behind him, this seems like a perfect match to us. If Ybarra shows the same tireless energy, control in possession, and acumen for the game, we think this could be one of the smartest signings of the summer - both for player and club.